Balance (for me) is never easy. Lately I feel I have ignored my blog slightly as I work to get my fabric shop up and running. There are a limited number of hours in the day and I find myself divided between regular life chores, sewing, writing, listing items on Etsy and shipping a few orders here and there. The other distraction for me is social media. Oh how easy it is to be sucked into it and look up 30 minutes later, wondering how to get that last 1/2 hour back. This week I have tried to stay with one task to completion before moving on to the next. I have also tried (with limited success) to stay off of social media and check it less frequently. I love seeing everyone’s posts on Instagram but really, it isn’t the best use of my time! Earlier in the week I made it my top (sewing) priority to finish quilting the Harmony quilt that I made last fall for my nephew. I really wanted to quilt it at the long-arm shop where I can rent time on their machines. After scheduling and rescheduling appointments several times, I gave up on that wish and decided to quilt it at home. As luck would have it, my Janome 6500 (which has a nice big throat) is being very cranky. This means I am quilting it on my little workhorse – an older Janome with a narrow throat. As a result, I switched over to standard straight line quilting. To add some interest, I am quilting it in two halves. Starting on the center diagonal line, I began vertical straight lines. Those vertical lines continue to the far corner. Then on the other half of the diagonal, I am quilting horizontal lines. (Does this even make sense?) At first I spaced them out about eight inches to anchor everything down. 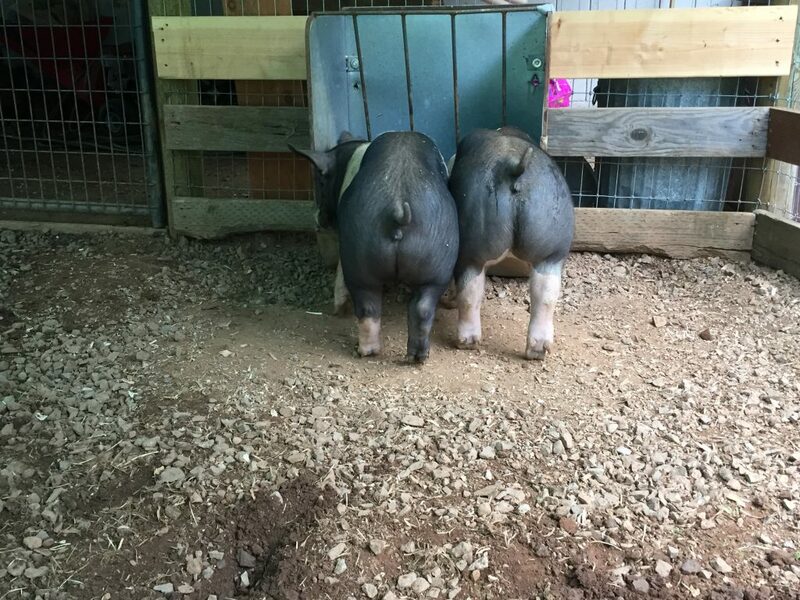 Now I am working on filling them in to about two inches apart. I think it is working quite nicely and I should be finished with the quilting in the next couple of days. Selecting a fabric for binding it is still up in the air. I am aiming for a scrappy binding with the leftover fabrics but I am unsure if I have enough. Buy more Fleet & Flourish. To be very careful with the scraps I have and make it work by adding in a larger percentage of solid fabrics for the last 12 blocks. Looking at these three incredibly important choices, my thoughts are these. Buying more fabric is silly. I have more than enough fabric on hand and should be able to avoid buying anything. Number three would probably be unsatisfying because I would have to use a whole lot of solid fabric to make it work and I don’t think the result would be to my liking. So, number one for the win. I will go slice six inches or so off several of the Garden Dreamer bolts downstairs in my shop and combine both lines. Phew! I am relieved to have gone through the process and made up my mind. Before I close and go off to quilt a few more lines and make a Sewcial Bee block or two, I want to share some pictures with you. 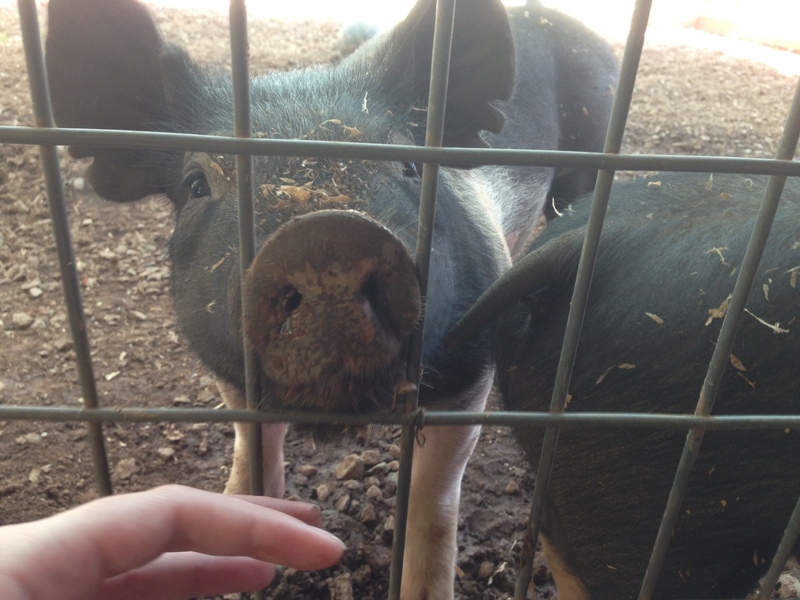 Remember I mentioned Julia was going to raise two piggies for her 4-H project? I have to say, these animals just crack me up. Here are some recent pictures with photo credit to my daughter. 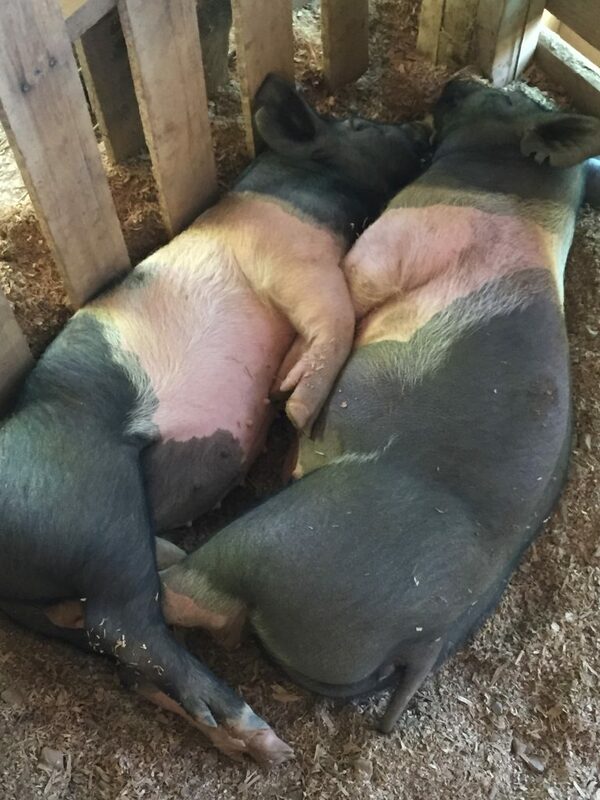 She is really enjoying this project and has done a great job with these two goofy pigs. 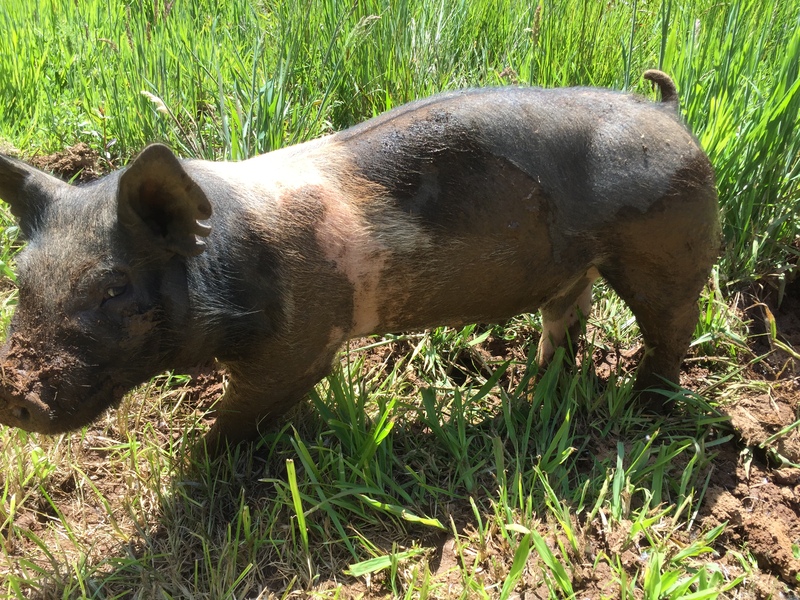 They are growing like crazy but then that is to be expected considering the amount of feed we are going through! Daisy, after playing in the mud. Off to the sewing room now. Wishing everyone a wonderful weekend! 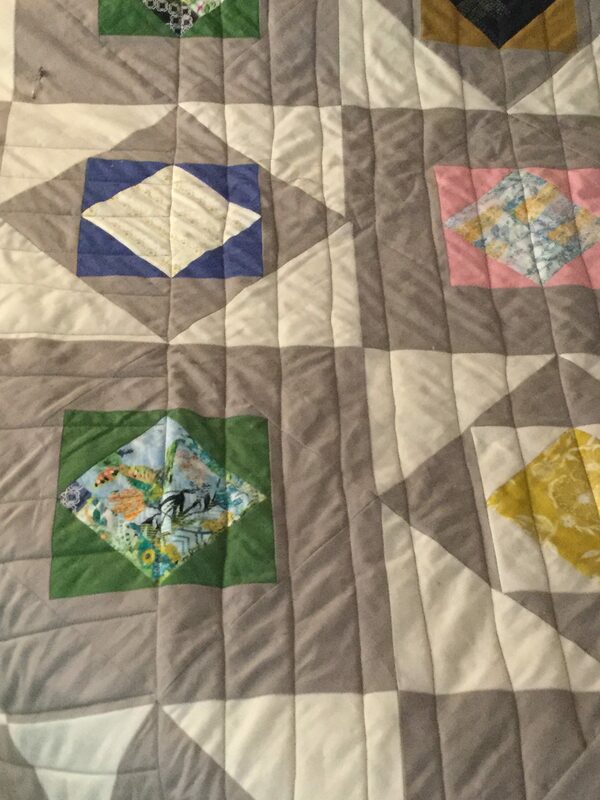 This entry was posted in Quilting Bee, Straight Line Quilting and tagged harmony quilt, sewcial bee sampler, straight line quilting on May 19, 2017 by Bernie. 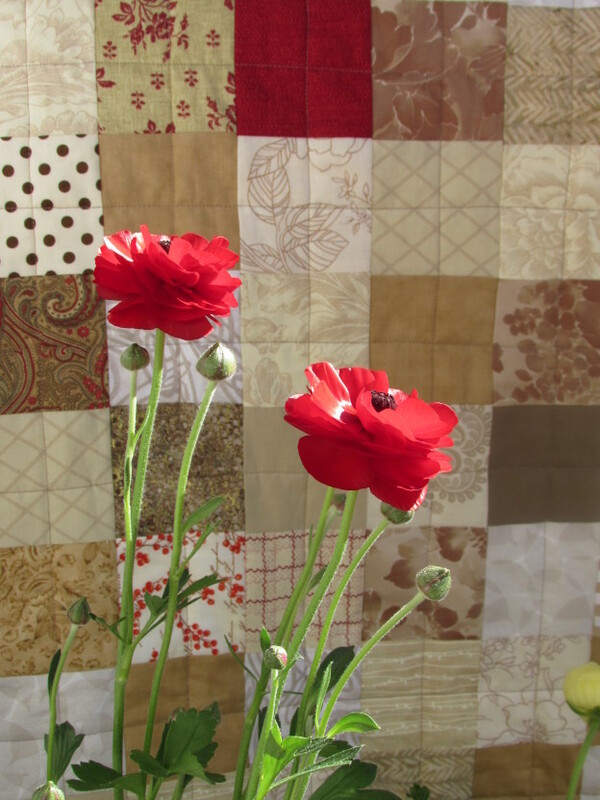 I really enjoyed playing with relief quilting when I made my FABRIC mini quilt a couple of weeks ago. So much so that I decided to make another one! I took plenty of pictures while making it so I could post a tutorial. I hope you will give it a try. The effect is wonderful and it is such an easy process. 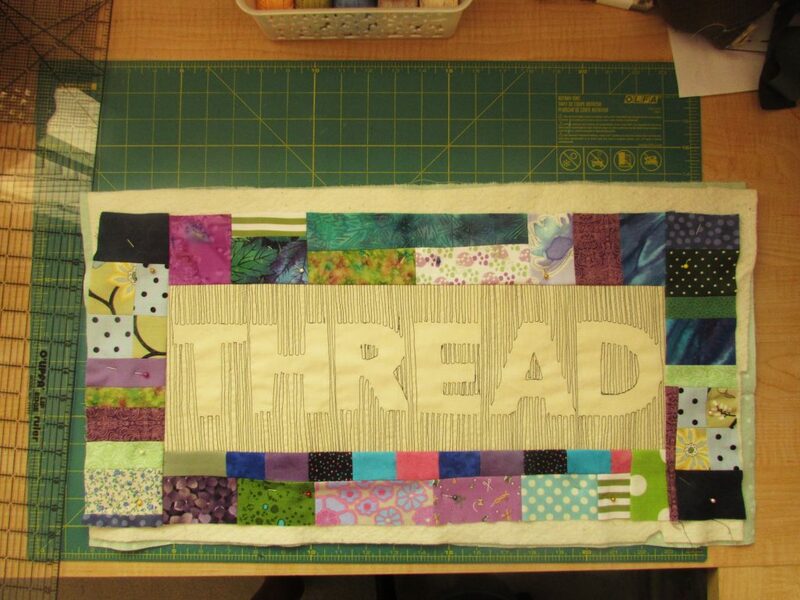 This time I wanted to try stitching the word on a piece of fabric with fusible stabilizer and then building the quilt from there. It worked out wonderfully. 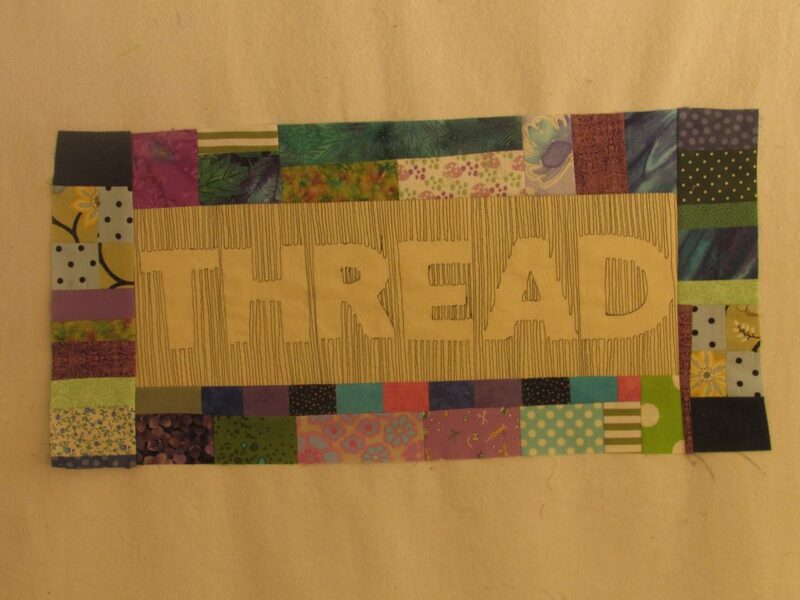 Since I already had one mini that said FABRIC, I decided to make another that said THREAD. This idea was inspired by a comment left on the first post by Diana, of A Red Delicious Life. She mentioned wanting to make one to hang above her thread. I decided to do the same. 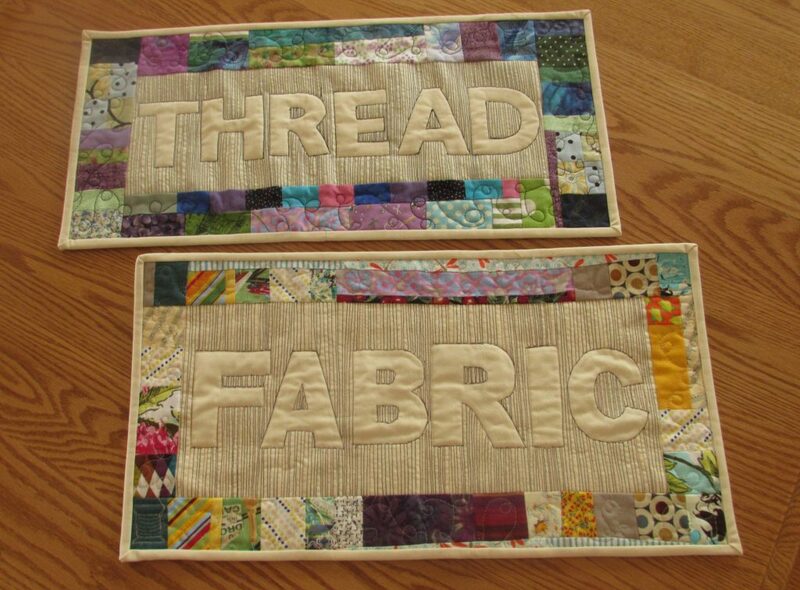 Now I have one to hang above the closet where I store fabric and another to hang above the thread collection hanging on the wall in my sewing room. Thanks Diana!! I am going to provide the sizes that I used but this is so flexible. Increase or decrease as you like. My quilt finished at 11″ x 23″ so if you want a different size, adjust accordingly. 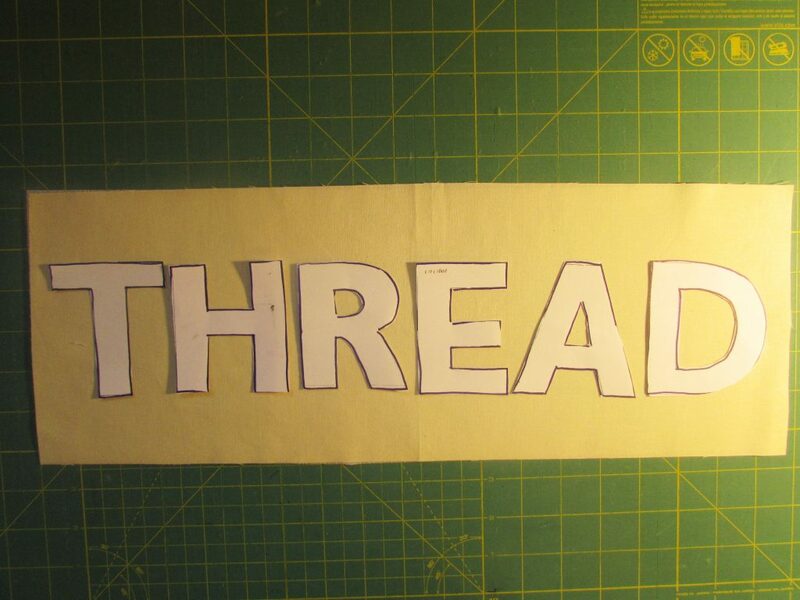 Stencils for tracing the word THREAD. I used letters that were 3″ high. 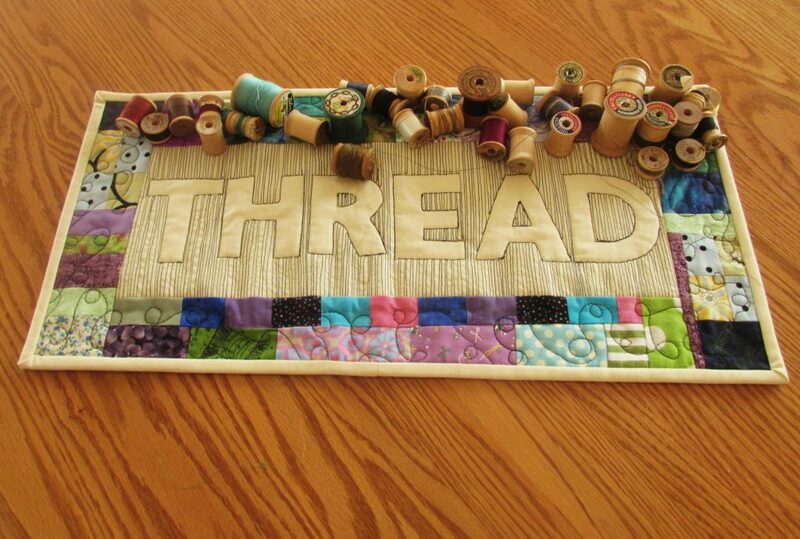 Quilting thread. I used YLI thread in a variegated green and loved it! Take your background fabric and fuse the stabilizer to the wrong side of the fabric. Follow manufacturer’s instructions if you are not familiar with this process. Trace the word on the fabric with the fabric safe marking pen of your choice. I didn’t leave very much room between the letters because I liked the way this looked. You could certainly adjust this to your taste. Also, I didn’t leave a ton of room on either side. Again, adjust as needed by cutting your background wider if you like. 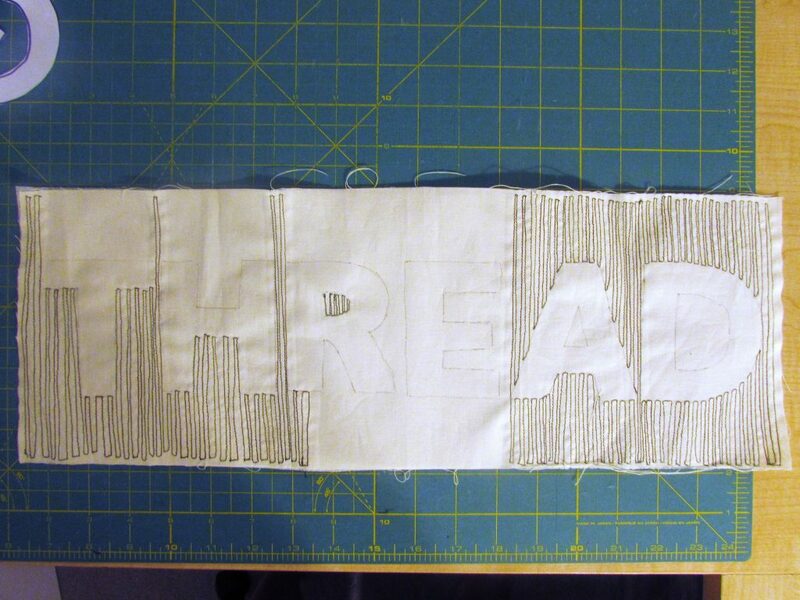 Using a walking foot, begin stitching long straight rows above, below and between the letters. I didn’t stitch the outline of the letters. This happens later on when you are quilting everything together. For now, just fill in every bit of space above, below and between each letter. You might choose to use a free motion foot for the little openings within a letter (e.g. 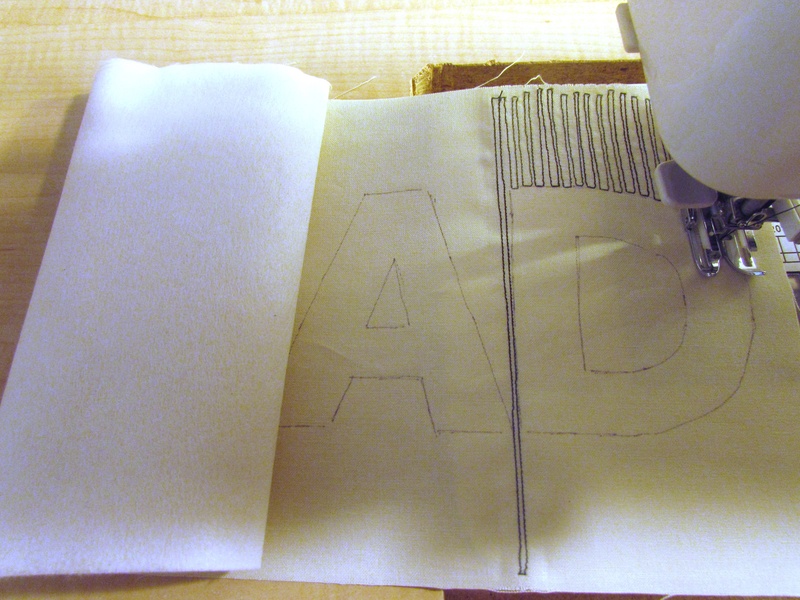 the A and the D) so you don’t have to start and stop, twisting the fabric. I kept working with the walking foot because the block is small and easily rotates. Each time I came to the botton or top and needed to move to the next line, I very slowly stitched one stitch over, sometimes doing so by manually turning the wheel on the machine so I moved just one stitch. This kept my rows extremely close together. If you have a needle down function, this helps. Just go one stitch and let the needle stay down while you turn the piece. Now and then, the width looked to wide to me and I would back up and fill in with another line of stitching. Remember you will be viewing this from a distance and it looks much better that way. 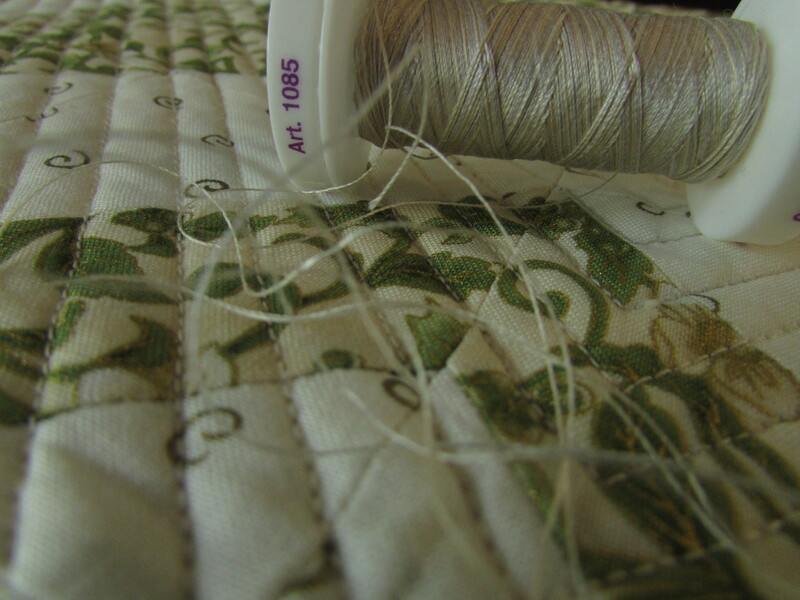 While stitching, you are looking at it from 6-8″ away and you’ll see every wobble. Not a problem. You are going for the overall effect. See how the word starts to come to life? I love that! Now keep on stitching! Making good progress here. The word is complete and it is time to begin working on your border. I made an improv border by taking squares and rectangles in my color scheme (basically greens, purples and blues) and built four pieces, two for the ends and two for the top and bottom. I didn’t worry about size too much. I made them a bit longer than the side I wanted to sew them to and since I wanted to have them trim out to 3 inches, I made sure the whole thing measured wider than 3 inches. Note: If you are not comfortable with this scrappy improv process, I recommend grabbing a copy of 15 Minutes of Play by Victoria Findlay Wolfe at your library. She does an excellent job of guiding you through. Alternatively, Amanda Jean Nyberg at Crazy Mom Quilts did a Quiltalong last summer called Scrap Vortex. In this post, she talks about building with scraps. It might be of help to you. 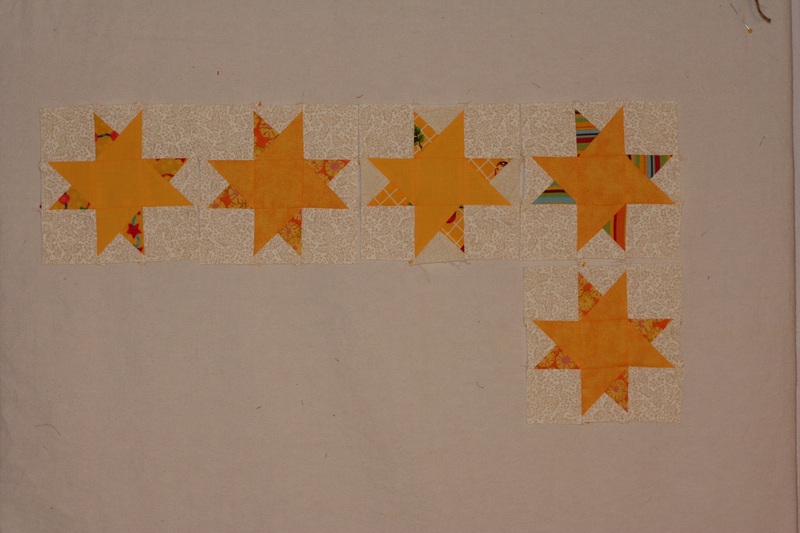 After playing with them on the design wall, I trimmed each to a width of 3″. I sewed the top and bottom borders on first and then added each side. The next step is to make a quilt sandwich with your top, the batting and your backing fabric. 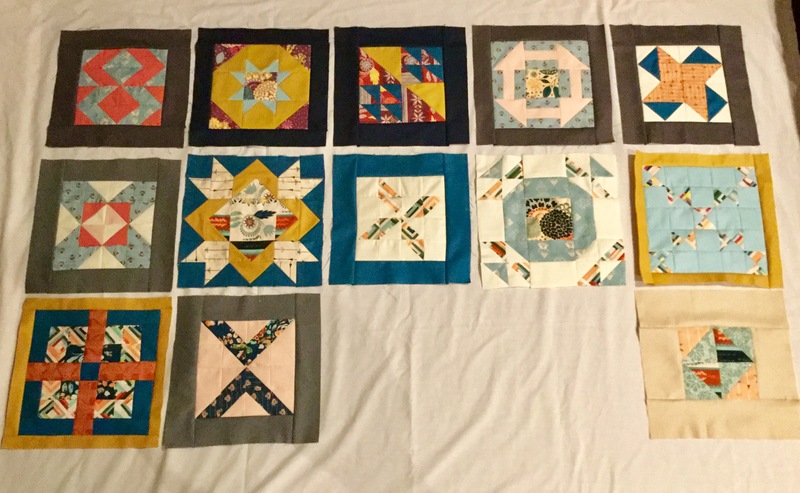 I pieced the batting from scraps I had. 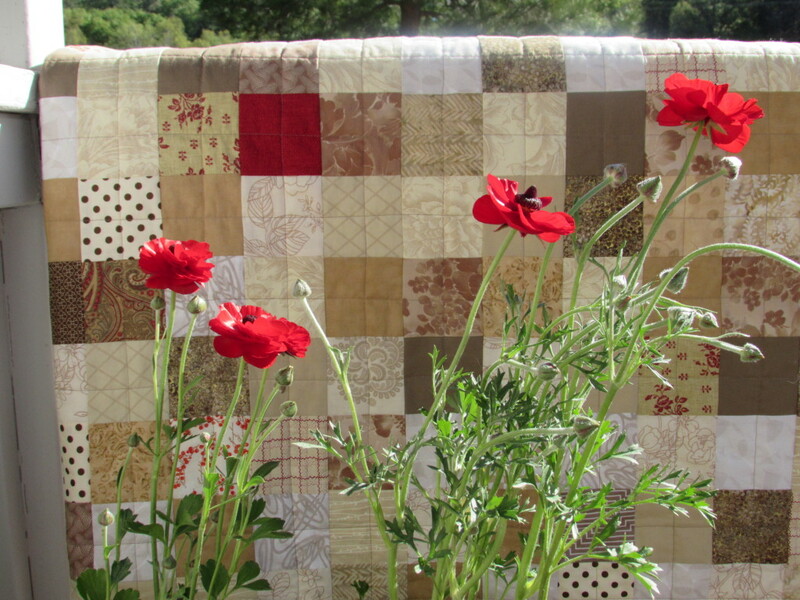 Just pin it around the border tightly since you are going to quilt in the center first. My batting was just barely bigger than the top but since it was such a small piece I felt ok with that. Normally I use batting that is a good two inches larger than the top all the way around. 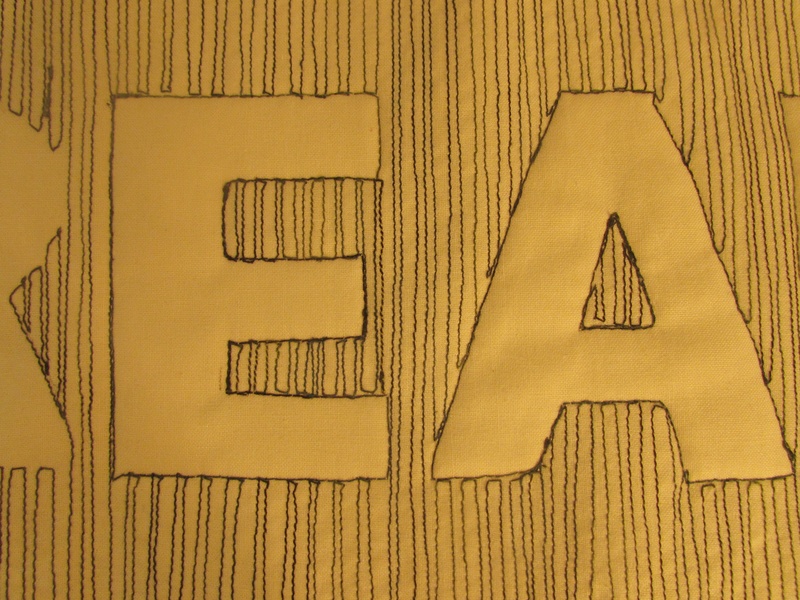 Continue to use your walking foot and slowly stitch around each letter. It is a bit like connecting the dots as you want to trace over the place where you stitched over to the next line. Just move slowly and turn frequently (with your needle down while turning) when stitching over a curve. I love the way the letters come to life when quilted to the batting. Next I moved on to the border. 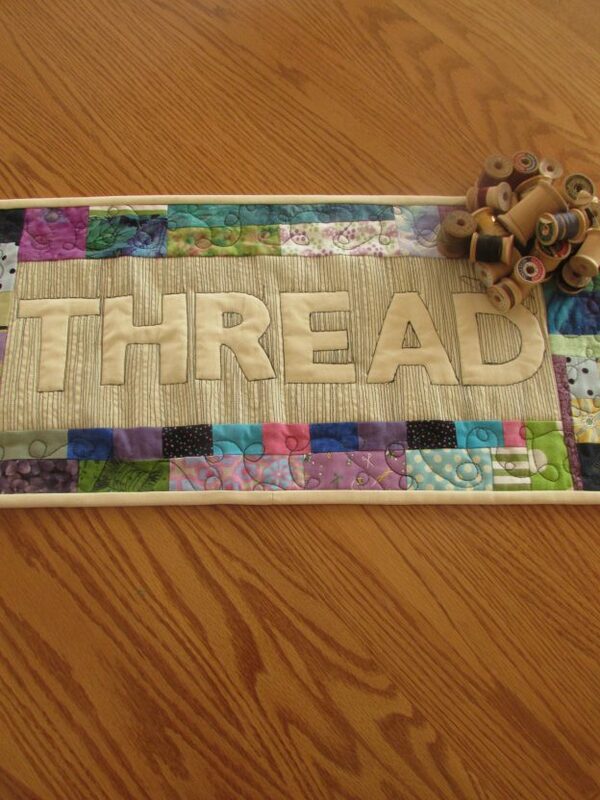 I love the little spools of thread that I quilted on the first piece and carried them through to this piece as well. 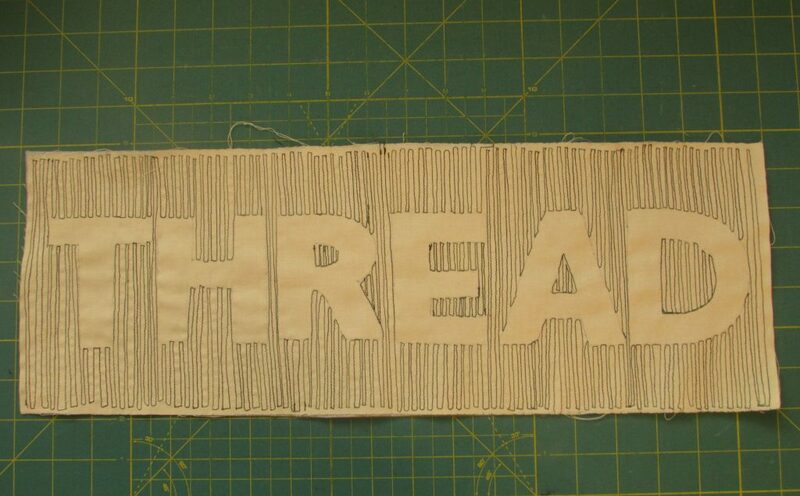 Considering the thread theme of this project, it worked well. With each spool, I filled in the top and bottom so they would show up a bit better. If you like this idea, take a look at this tutorial of Lori Kennedy’s over at the Inbox Jaunt. 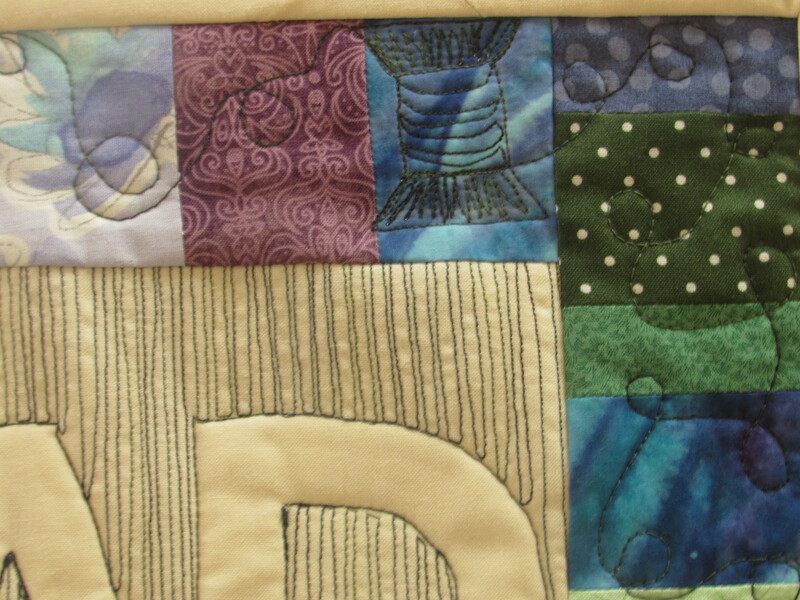 The spools are whimsical and they add a bit of movement to the quilting as the ‘thread’ flows off each spool. Once you complete the quilting, trim, square and bind. Finished! And both of them together?? All kinds of cuteness. What fun (and easy) projects both of these were. I have the sleeve sewn on to FABRIC but still need to make a sleeve for THREAD. They will be on the wall soon. I’ll post a picture next week. I hope my explanation is helpful. If you make one, let me know. I would love to see it! I’ll be linking to the usuals which can be found at the top of the page, under Link Ups. 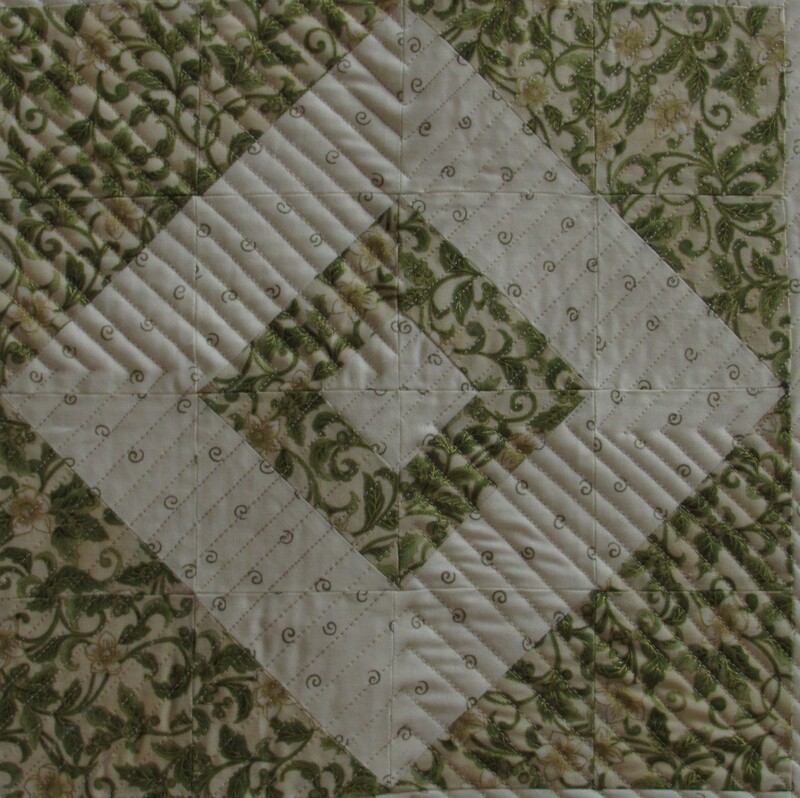 This entry was posted in Improv Piecing, Mini Quilt, Scrappy Quilting, Tutorials and tagged improv piecing, relief quilting, straight line quilting, tutorial, walking foot on August 27, 2016 by Bernie. The weekend is just about here. Julia is going to her first high school football game tonight and we are not a football family. It is rare that you’ll hear any talk of sports in our house. But I am fairly certain that 14 year olds don’t go to football games for the sport – it’s all about the friends. She will have a great time and I will wonder how she got to be this age so quickly. It was a busy week here in Grass Valley, CA (doesn’t that sound just like Garrison Keillor? I love him.) I decided I was tired of looking through filthy windows so I hired a couple of window cleaners to come and clean them. We have lots of windows (40 to be exact, I paid per window so I now know this number.) Turns out that having windows cleaned involves lots of prep on the part of the window owner. They asked me to clear any items near the windows so they could have access. Yikes. My sewing table, ironing station and cutting station are under a window. I am sure you can imagine. But after I got the house put back together, it was well worth it. Shiny clean windows. 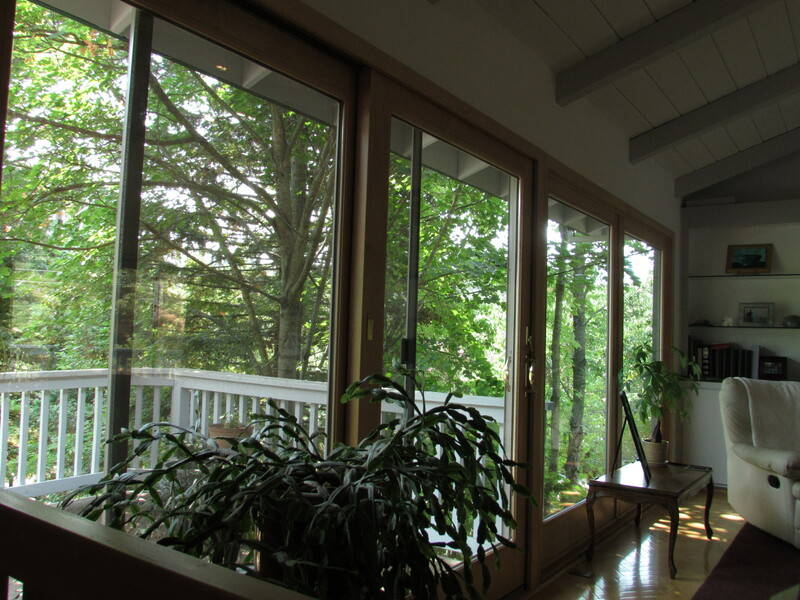 Just in time for fall colors… the maple trees near these windows turn a great shade of yellow-gold and now we will enjoy the changes that much more. (Well, that’s if fall ever comes, it is a balmy 98 degrees outside today. Time in the sewing room was not plentiful this week. I did finish up one quick project though. Remember the block-hop that I posted about last week? When I was playing with the design for that block, I did a mock up first. I used some holiday fabric that I had (mainly because it was right next to the cutting area and saved me the long walk to the closet across the room where my stash is stored.) The block was pretty though and I wanted to use it for something. I added two borders, one 2″ wide and the other is 3″ wide. With these borders I ended up with a pillow cover that is about 21″ square. I used an envelope backing and stitched a seam 1″ in from the perimeter to make a flange. 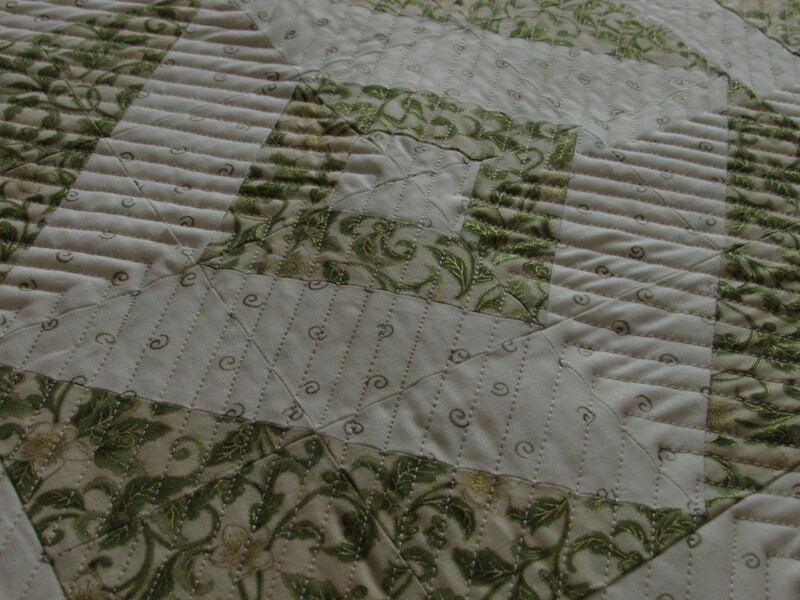 Straight line quilting with a fairly narrow gauge was done on an angle, dividing the pillow into four quadrants. I used a Mettler variegated thread with shades of gold, silver and cream which I love with these fabrics. 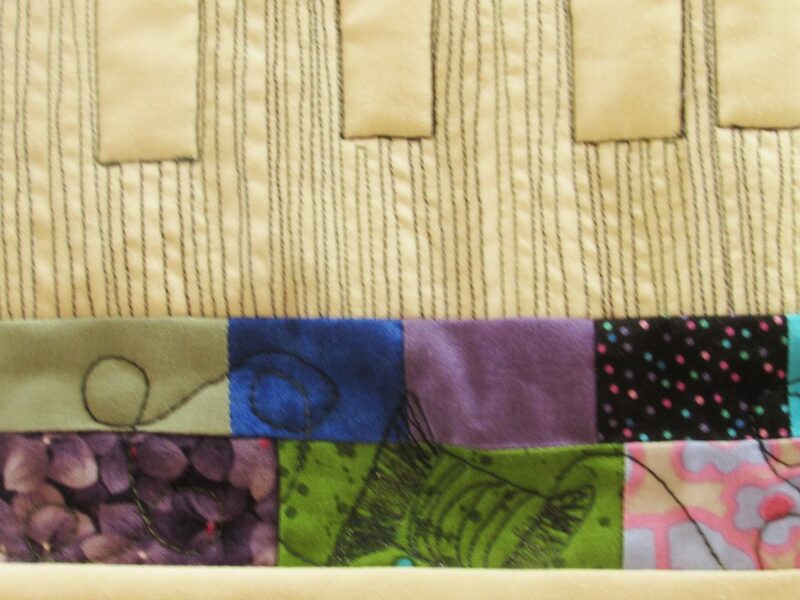 When I quilt a pillow, I sandwich the quilted portion with plain muslin and pieced batting scraps. The quilting looks kinda cool on the muslin side. It makes me want to try some sort of whole cloth project to really emphasize the quilting. Another addition to the list…. It will be fun to pull this out in a few months when the time comes to decorate for the holidays. Hoping everyone has a great weekend. Seems like it is hot across the country right now. Maybe this is the last blast of heat before wonderful autumn starts. Linking to Finish it up Friday at Crazy Mom Quilts, Confessions of a Fabric Addict as well as Freemotion Mavericks (even tho this is quilted with a walking foot, not my darning foot.) All links to these link parties are available at the top of the page, under Link Ups. 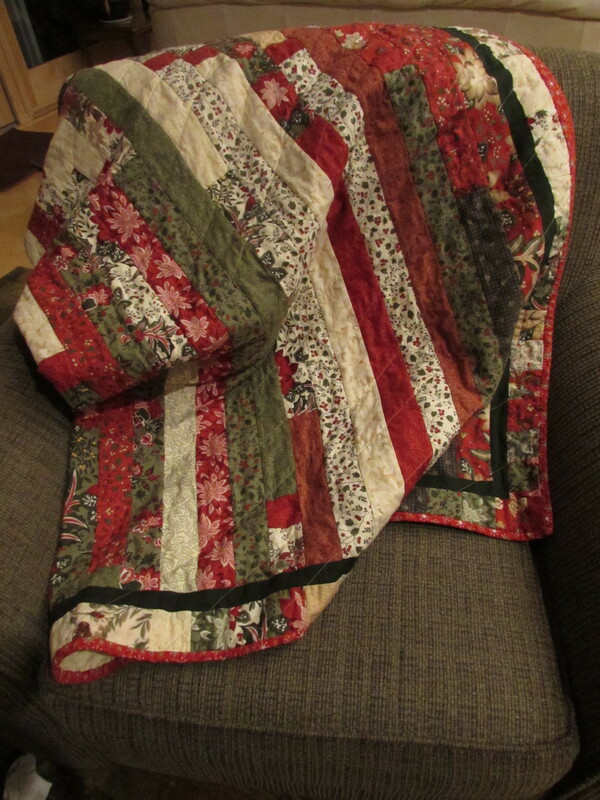 This entry was posted in Christmas, Quilted Pillow, Sewing Projects, Straight Line Quilting and tagged quilted pillow, straight line quilting on September 11, 2015 by Bernie. So pleased to show this week’s finish!! I love this quilt for a variety of reasons. The colors are just what I wanted for one. I have always loved a basic pallette using neutral colors. As I mentioned earlier, I then decided I wanted to put a pop of red it. The more I played with this, the more I liked that red. Thus the addition of the large red heart! The biggest reason though is that it is my own. The design is simple but it came from me; I didn’t use anyone’s pattern and that is absolutely a first. I used straight line quilting going in several directions. 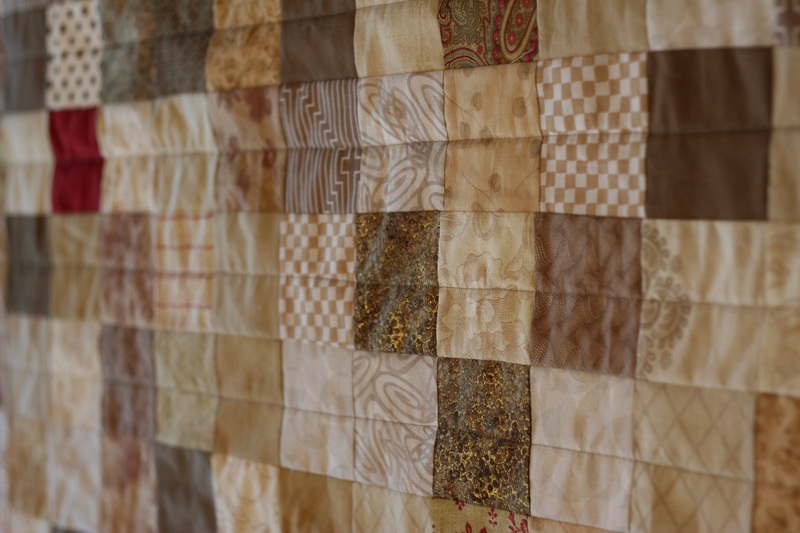 The hearted was densely quilted with lines about 1/2″ apart. I used the edge of the walking foot as my guide for that. 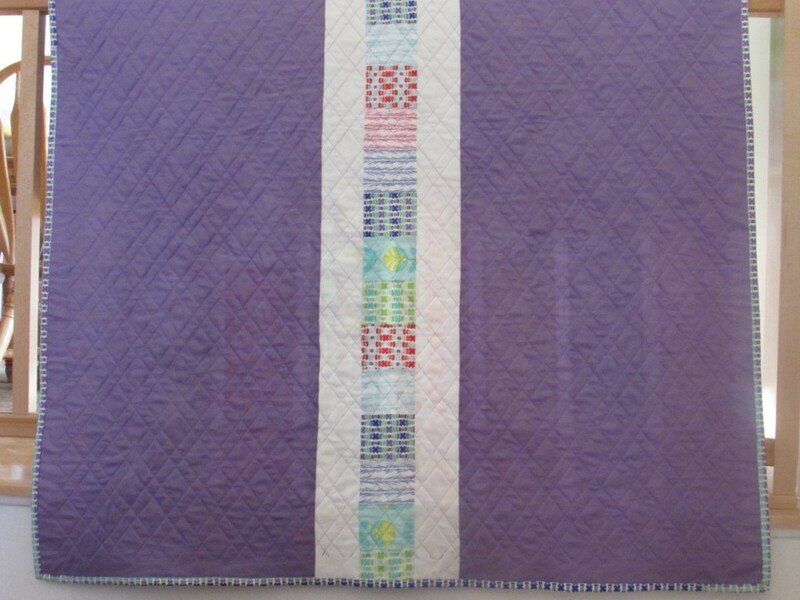 The body of the quilt has straight lines going through each square, both horizonally and vertically. I started out marking each line with my Hera Marker but after a while, I got used to the patterns in the fabric and used those to guide me along and just freehanded it. Much simpler and very freeing! I took my time with this and didn’t rush to finish it. 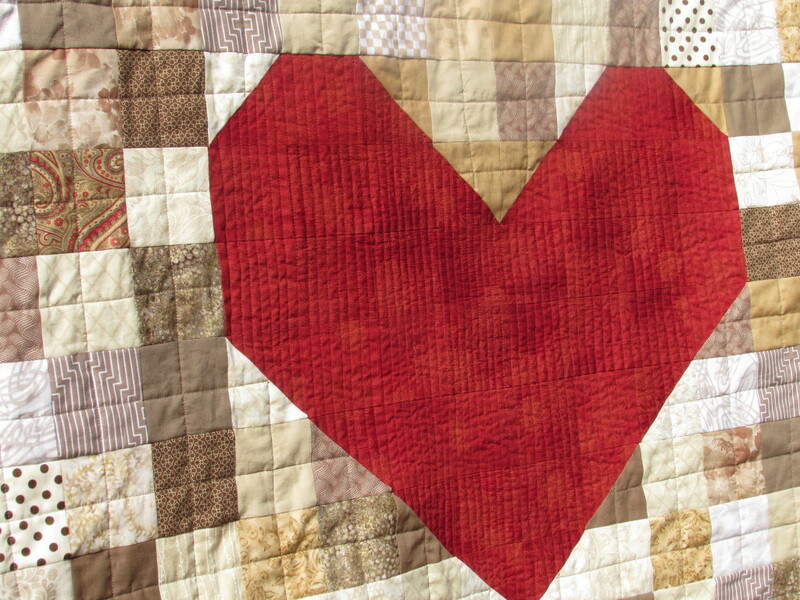 I did get antsy when I was quilting it and again when I was burying the threads around the red heart. I reminded myself to relax and enjoy the process and it was so nice. I loved every bit of it – even the annoying tasks like cleaning up the myriad little threads all over the back before sandwiching it. Even (and especially) sewing the binding to the back. I do love the process. I think part of the issue is that I feel like I should crank something out so I have “something” to write a post about. This was in the back of my mind but really, even though this blog is something I truly enjoy, I don’t want to be cranking out finishes just so I have a post. That doesn’t make any sense to me. After I got the quilting finished up, I was looking at it trying to decide how I wanted to bind it. I had enough of the fabric from the backing to use as binding but I was torn between using that and using the red fabric from the heart. 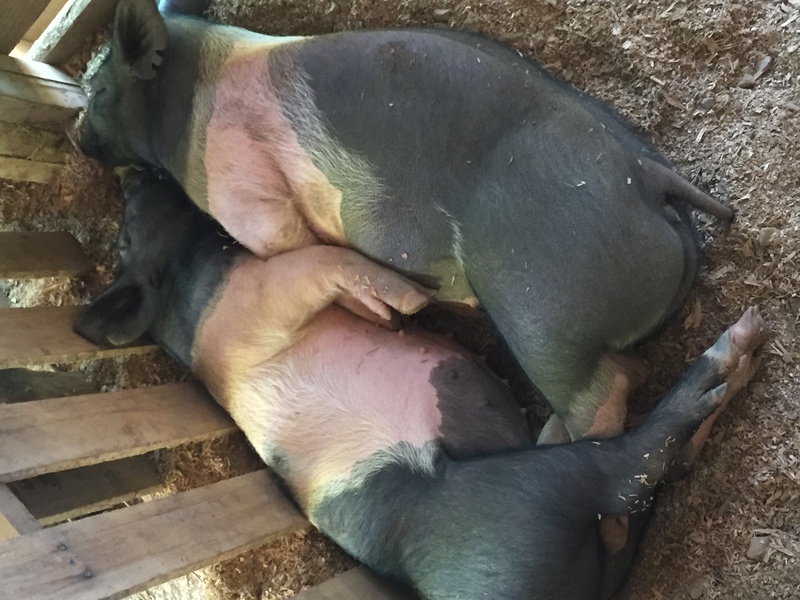 Finally I remembered a post I had read a long while back over at Persimon Dreams. 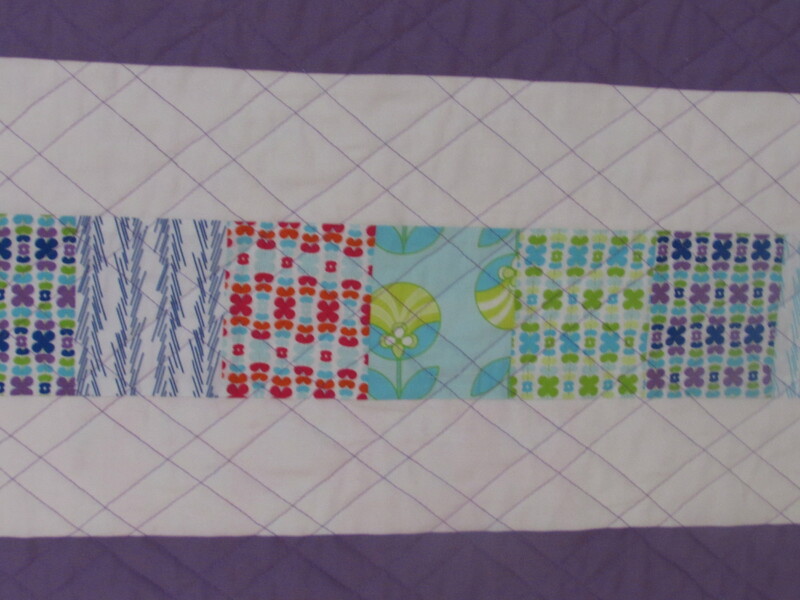 She had placed a very narrow flange on the quilt before binding it to add a pop of color. Yay-it was the perfect solution. I commented on that particular post and Kim was so kind to send me a quick email explaining how she did it. (So, actually part of this quilt was inspired by another but that’s ok. I want to give credit where credit is due.) Adding the flange took very little time and I think the effect it provides is wonderful. If you haven’t ever done a flange, it is very easy. 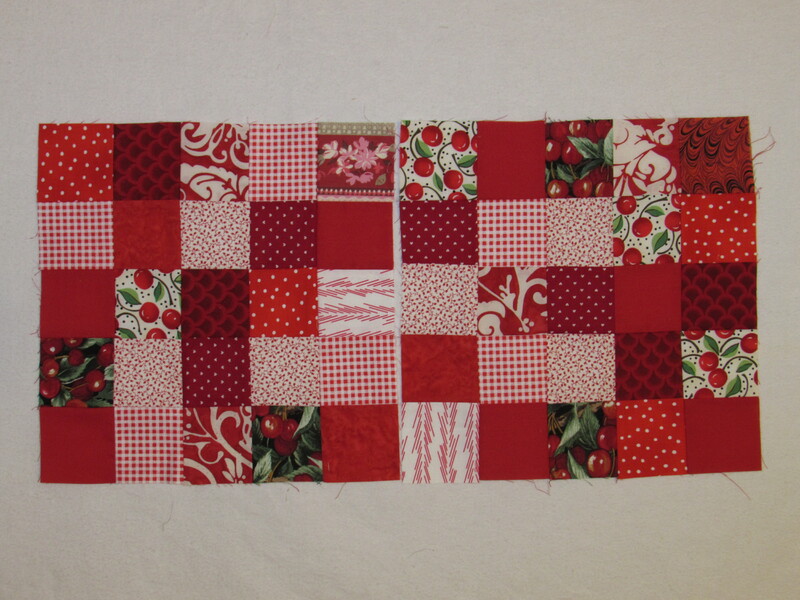 I cut strips that were one inch wide of the contrasting red fabric. Then I sewed them together, just as one would with a binding strip. 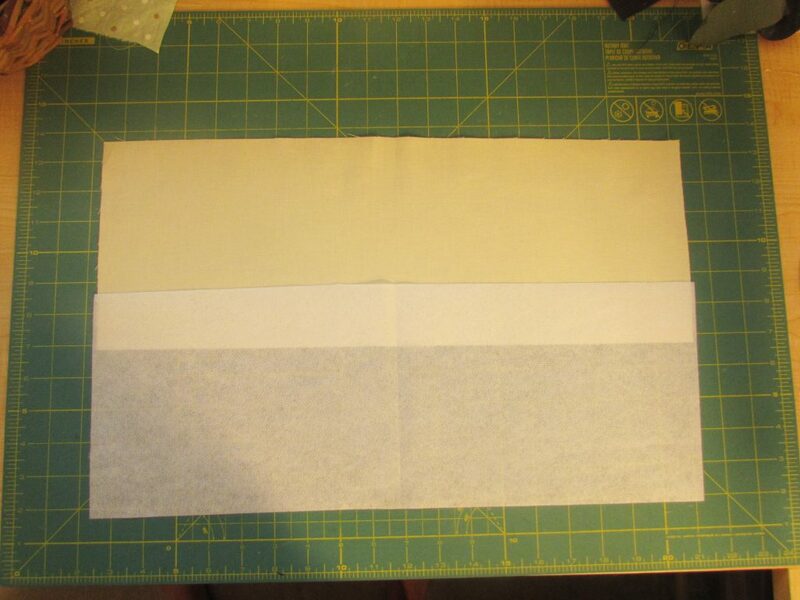 Fold it in half and press so you are left with a 1/2″ wide folded strip. (Kim used a 3/4″ strip ending up with a 3/8″ folded piece but I wanted something a little bit wider.) 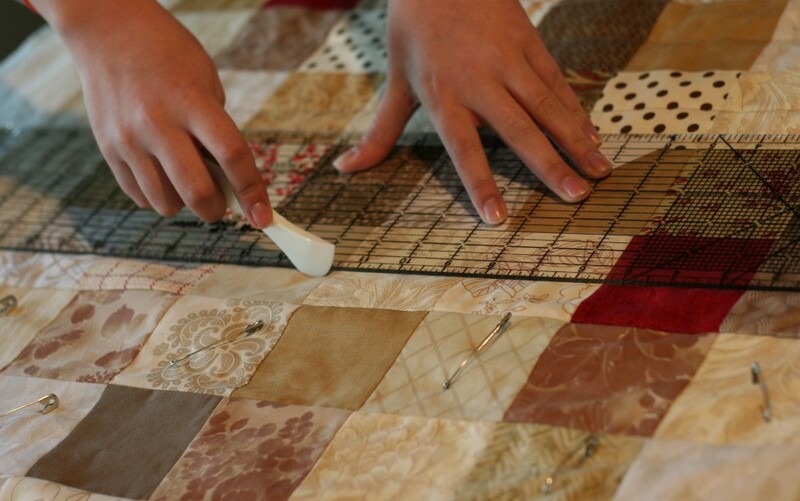 Once you have the flange prepared, attach it to the quilt’s raw edge on the top side. 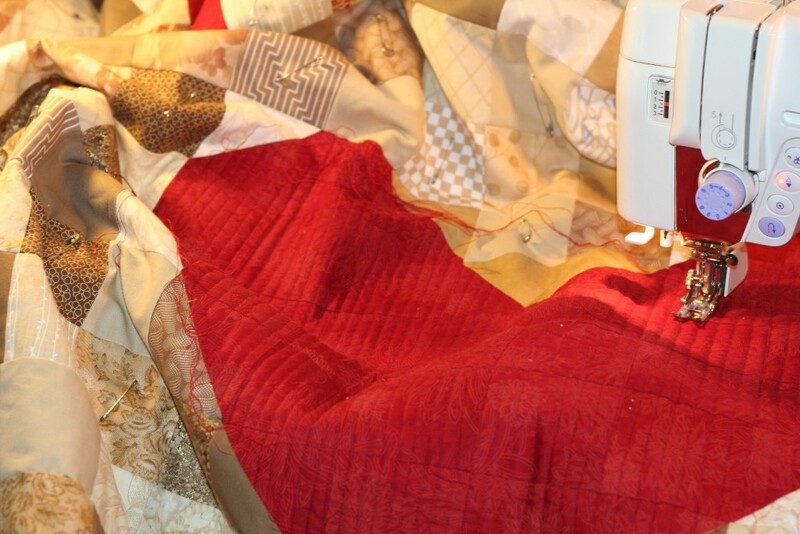 Sew it to the quilt using a VERY scant 1/4″ seam. I used a longer stitch (my Janome was set to 3.5 stitch length) which made attaching it a breeze. Then attach your binding as usual. Be sure to hand stitch the binding to the back. If you machine stitch it, those stitches will show on the flange. Easy peasy! If you have any questions, let me know in the comments. Yep, this was a great finish and I will be gifting it to someone soon. 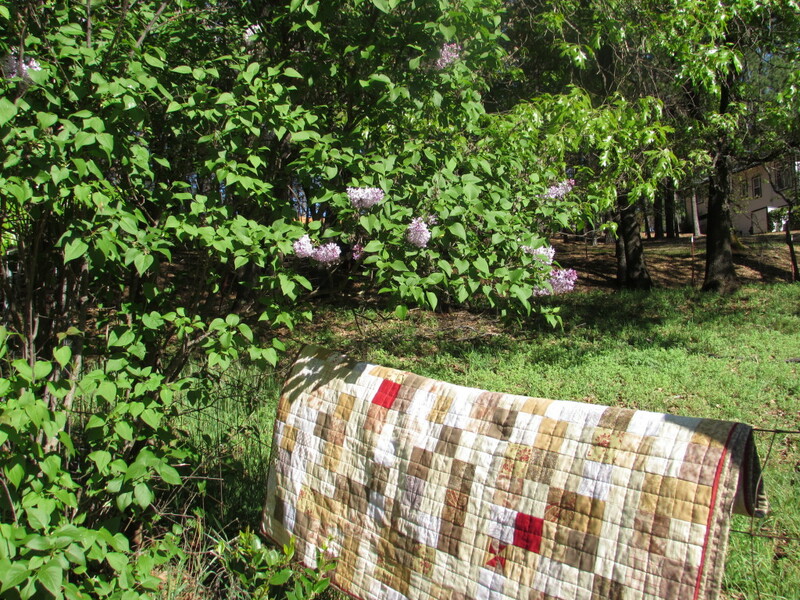 That is the best part – giving it away and giving someone the joy of a cozy quilt. Hope the recipient loves it. Linking to Sew Bittersweet Designs as this is my March finish for ALYOF. Yahoo for setting a goal (I had better plan my projects for April soon.) Also linking to Freemotion by the River and Let’s Bee Social. 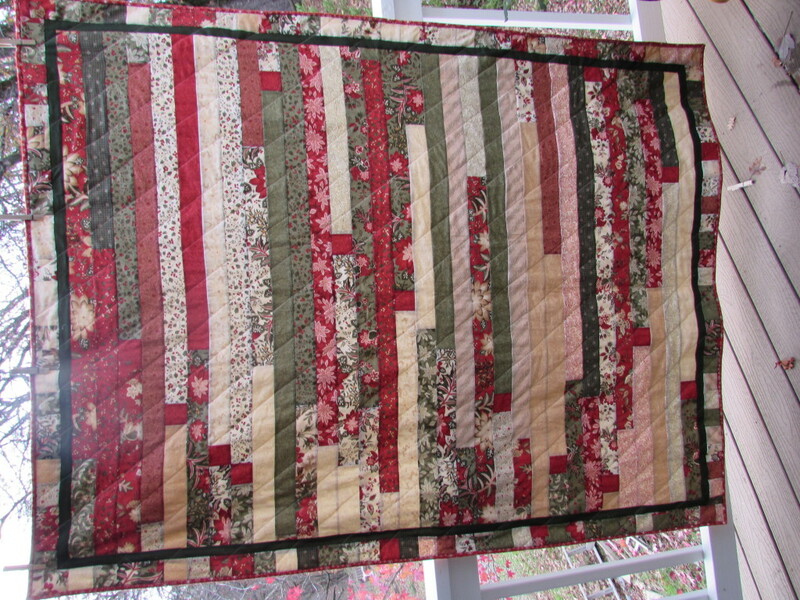 This entry was posted in ALYOF, Scrappy Quilting, Tips and tagged flanged binding, flanged binding tutorial, patchwork, pieced heart quilt, scrappy quilt, straight line quilting on March 25, 2015 by Bernie. I haven’t spent a whole lot of time at the sewing machine this week. Lots of regular life going on and my neck was being sort of cranky. But that’s ok. I did get a few odds and ends done. 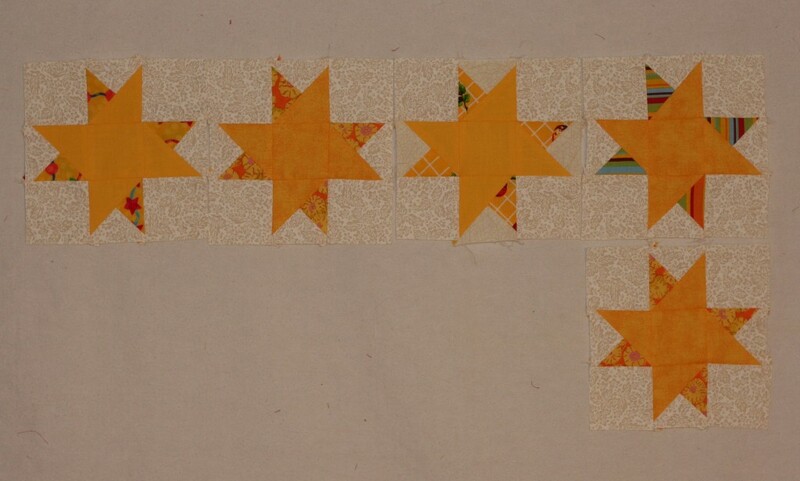 For RSC15 I am working on the March blocks from the Classic Stitches BOM over at Academic Quilter. I only finished five of the ten blocks but they are really fun. For the kitchen in our Downieville house we decided to put in pleated shades. 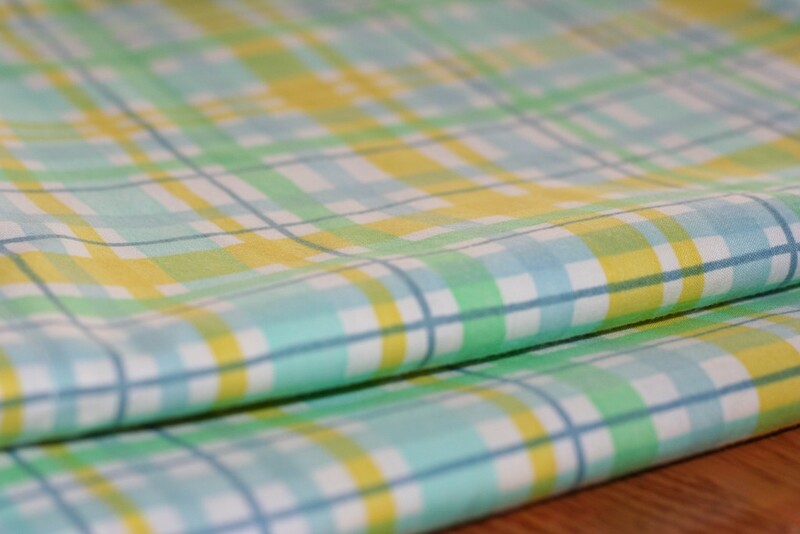 In keeping with the vintage look of the kitchen, I ordered a Waverly plaid that was printed in yellow, blue and green to make valances. We have green and yellow on the walls and I just put a 1950’s formica table in the eating area. It is gray with turquoise trim and the chairs have turquoise vinyl on the seats. I love pulling all of the colors together with these valances. I made a valance for each of the four kitchen windows. Hopefully we will be up there working on the house over spring break so I can hang these soon. 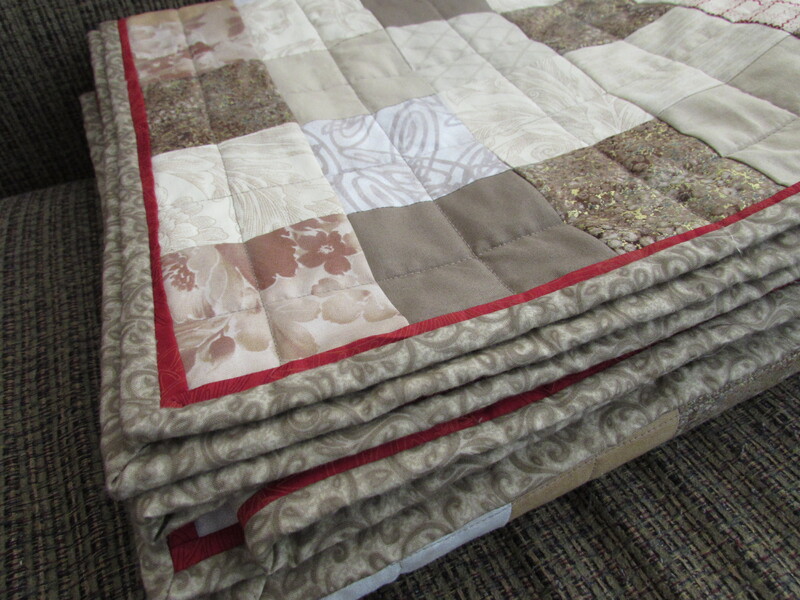 I’ve also worked a bit on the quilting for the neutrals quilt. I have a newfound appreciation with my Hera marker (which is made by Clover). I bought this (inexpensive) little tool months ago and each time I use it, I am so impressed by it. If you don’t have one, this tool is used to mark lines for quilting. No worry about removing ink or chalk after you sew. It is so cool. 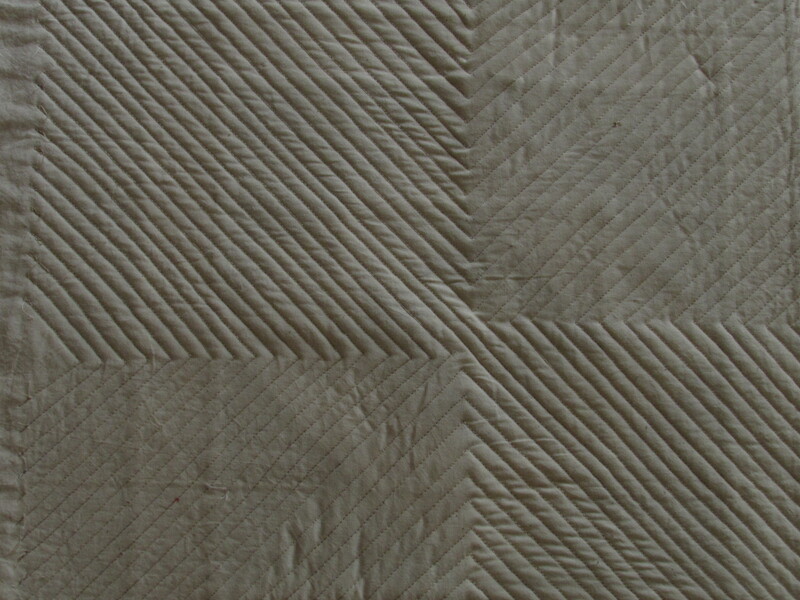 I have been marking the lines on the neutrals quilt with it. The lines aren’t always easy to see. But the indentation left by the Hera marker is enough to guide me along. I don’t mark more than two lines at a time because the indentation doesn’t last very long. If you mark a line and don’t like what it looks like, a simple spritz of water (lightly sprayed) will remove the mark, as will smoothing the fabric with your hands. I don’t know that I would rely on this for intricate marking, but for straight lines it works great. If you want a quick tutorial on using a Hera marker here is a brief video – though it is so simple, not much instruction is needed. I am quilting down the center of each three inch square and when I finish this direction, I will quilt down the center, going the other way. For the heart I used lines that were much closer together. I didn’t mark these, just used the edge of the walking foot to judge the distance. It seems to solidify the heart, almost removing the lines of the patchwork. Looking good so far. Should make my (ALYOF) goal of completing this quit in March. Yahoo! I was lucky enough to have one of my sisters here for a couple of days to visit this week. What a treat. Even better, her son was also here briefly. My nephew and his wife live in Japan which means I don’t see him very often. We used to live next door to each other when the kids were growing up and I miss having them around all the time. Family visits are the best. That’s the update for the past week or so. Hope everyone is doing well and spending some time with at the sewing machine and some time hanging with family. Best of both worlds! Linking to Freemotion by the River and Let’s Bee Social. As always, links to these sites are available at the top of the page, under Link Ups. This post is also linked to Stephanie and Michelle at Late Night Quilter for Tips and Tutorials Tuesday. 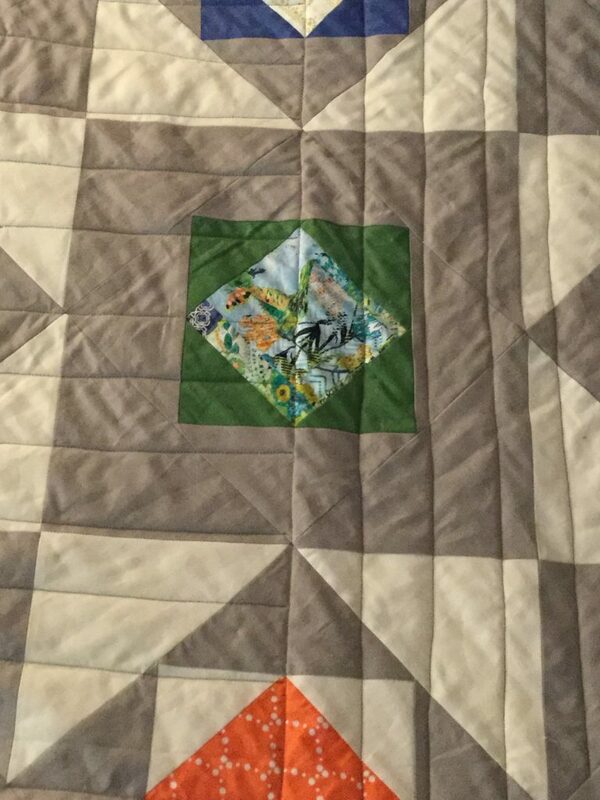 This entry was posted in ALYOF, Quilting Tools, RSC Challenge, Sewing Projects and tagged academic quilter, Classic Stitches BOM, Hera Marker, RSC15, sewmystash2015, straight line quilting on March 18, 2015 by Bernie. I am sitting here in the kitchen listening to it pour rain. Living in parched California, this is really a wonderful sound. As we were enjoying the downpour my cell phone and my husband’s cell phone start beeping with one of those emergency alert sounds. Apparently it is coming down so hard that the Weather Service is posting flash flood warnings! It’s ok, we need it so desperately. There is actually one tiny town in Central California, called Porterville, where many of the residential wells have dried up. Truly and completely dried up. The residents of that town are buying their water and taking sponge baths. The city officials actually brought in portable showers so the 600+ residents with dry wells could have a hot shower (the rule is to bring your own towel and soap.) Clearly it is no exaggeration that we are experiencing a drought. The fact that my rain gauge shows 2.43 inches of rain in the last 24 hours is wonderful! Today I gave the first Christmas gift of the season! 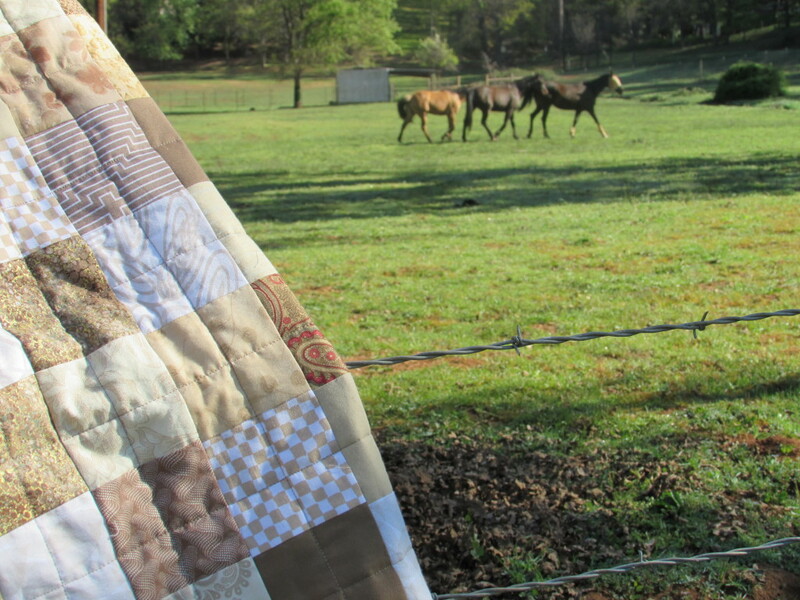 How fun it is to gift a quilt to someone – I love the feeling of making it for someone special and knowing they are touched when they receive it. I made a 1600 quilt top (jelly roll quilt) back in October. You can read about it here. Using Moda’s “Merriment” line, it turned out to be lovely shades of deep red and pine green with lots of creamy colors thrown in for good measure. It is technically a holiday print but really it isn’t that “Christmasy” so I think it can be used throughout the winter months. 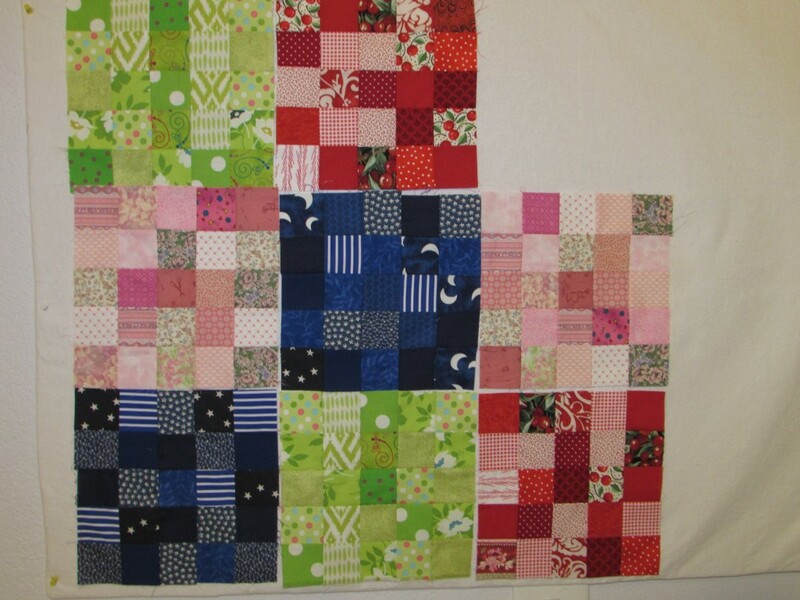 I cut off enough of the edge of the original quilt top to be able to create a pieced border around the edges. 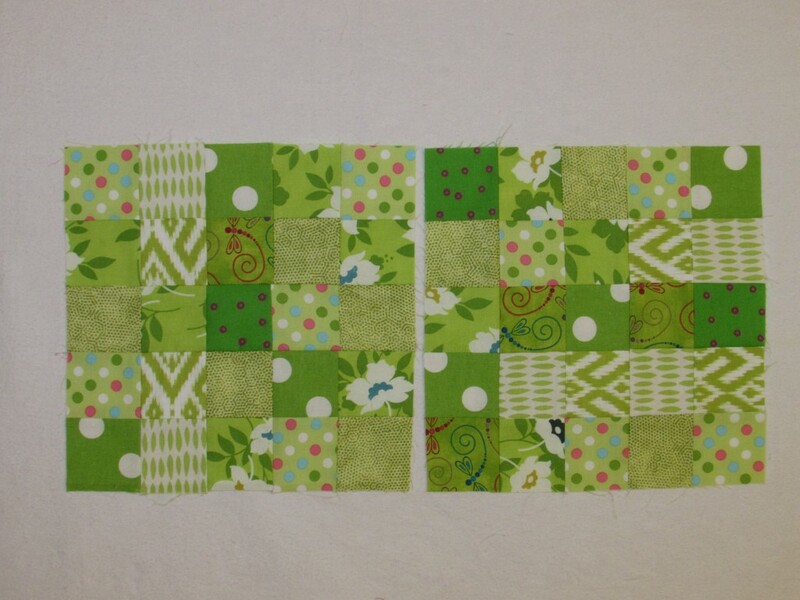 I put a narrow strip of pine green between the main section and the border. 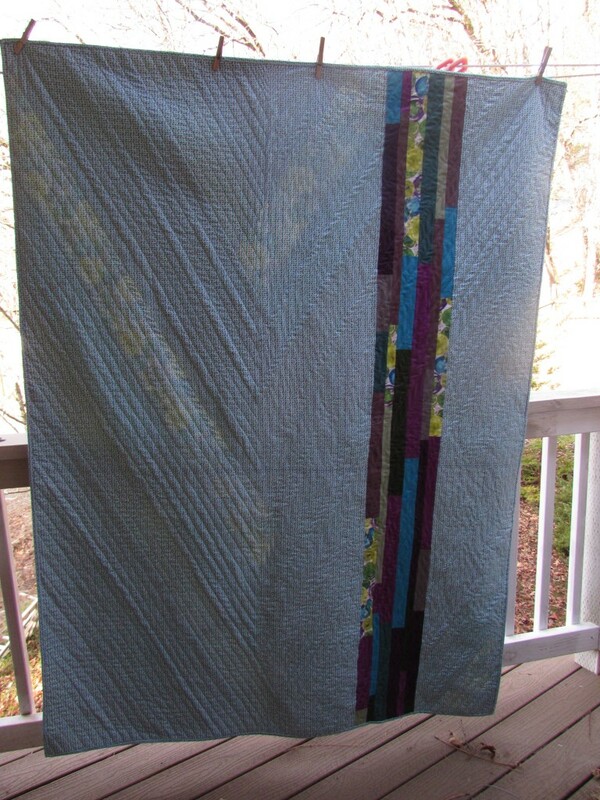 Using diagonal, straight line quilting made this project a breeze to quilt. The most fun was bringing it over to its new owners, my Mom and Dad. 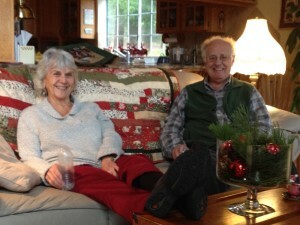 Merry Christmas – I thought I would give it to them now since they were just decorating for the holidays. They love it and it looks great on the couch, right near their wood stove. So cozy. The picture isn’t the best, I only had my phone with me. But look how cute! I have started another project that will be gifted at Christmas time. That won’t be shown here until after the holidays. Don’t want to ruin the surprise. Time to go read my book and listen to the rain. Hope all is well at your house! Linking to Let’s Bee Social, Linky Tuesday, Confessions of a Fabric Addict, Crazy Mom Quilts and TGIFF. Take a peek at all of these link ups to see so many amazing projects. As always the links are available at the top of my page, under Link Ups. Also…. thanks in advance for your comments, they always make my day! 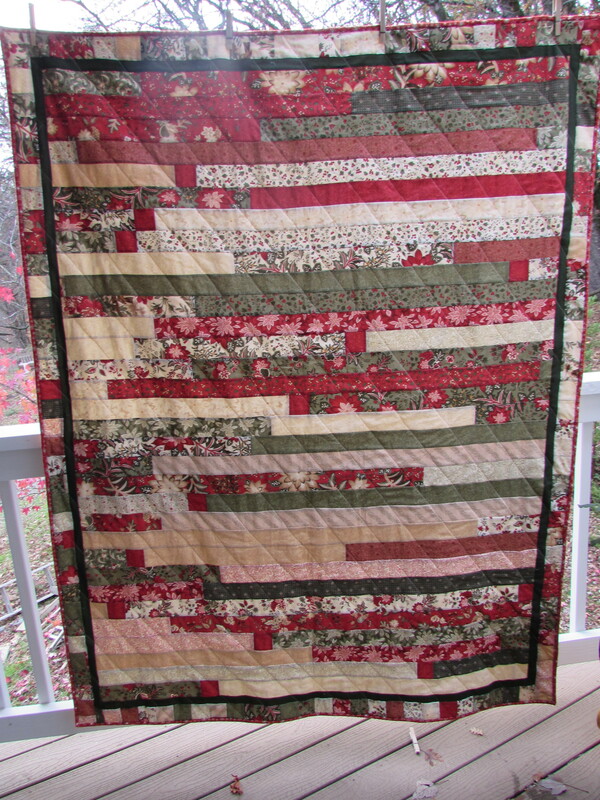 This entry was posted in Family, Holiday Quilts and tagged 1600 quilt, California drought, Christmas, holiday quilt, merriment by moda, straight line quilting on December 3, 2014 by Bernie. This summer flew by. I knew it would because we had a lot of different things scheduled when it started. That usually makes time go by (too) quickly. 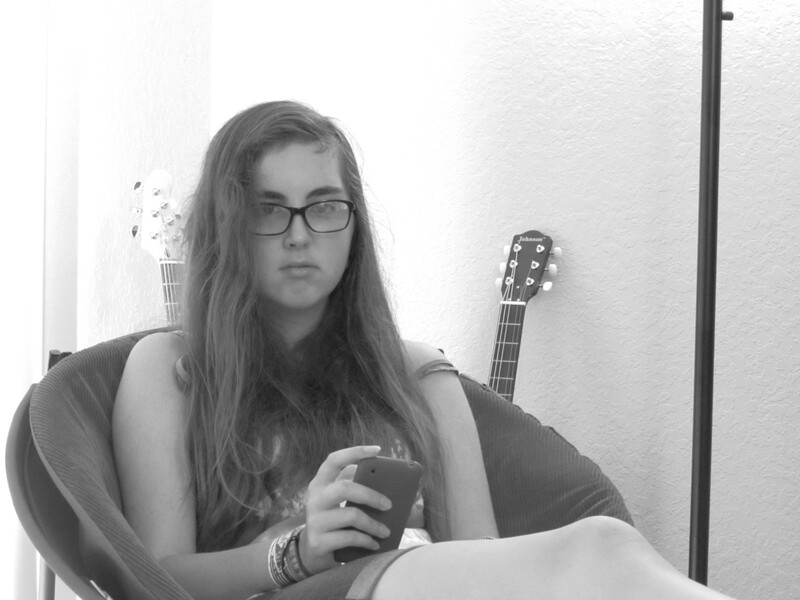 This week and last were filled with appointments for my 8th grader that are easier done during summer. The dentist, the orthodontist and the optometrist. When I took her for an eye exam (she usually only has the quickies that they do at school) and found out that she is near-sighted. She and I were both so surprised. He asked her if she has to squint a lot or if she had trouble reading the board at school. She innocently says, “No squinting but I can’t read the exponents during math.” I looked at her and wondered why she didn’t ever mention this?? The doctor said that when this happens gradually the person just doesn’t really notice. Now she is happily wearing glasses and keeps lowering them on her nose, looking ahead without them, then through the glasses. Comparing the difference with awe. So funny. In between all of that I got loads of time at the sewing machine. Hurray!! Here are some of the things I worked on. First off was this little baby boy quilt. Puppies and boys, perfect fit, right? 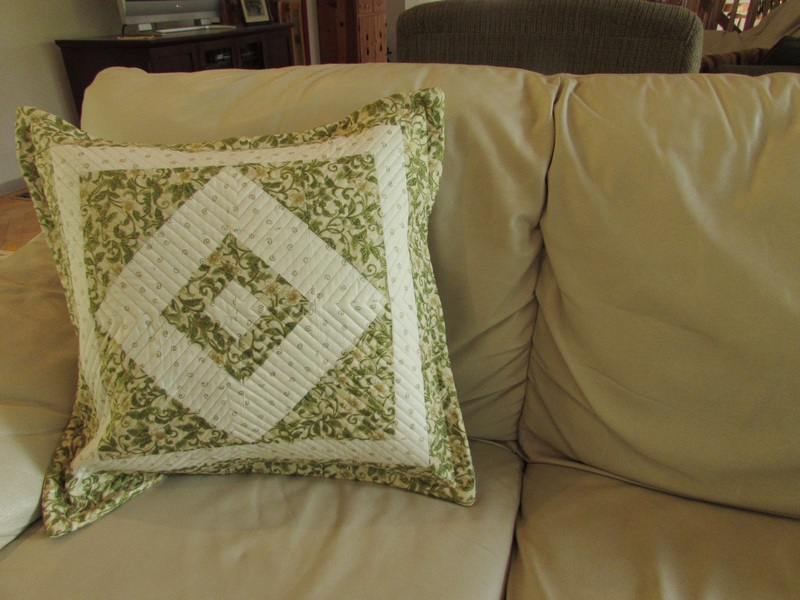 I used a simple patchwork of charm squares for the center. Borders of navy blue were added, as well as a stripped border made from the leftover charm squares. This was inspired by a photo I saw on Pinterest. Very easy to do. I didn’t really do any math beforehand; rather I just built it as I went along. The fabric is called “Here Boy” by Abi Hall, designed for Moda. This line is adorable. It features puppies, dog bones and bouncing balls. The colors are bright and happy, blues, orange, reds, green and yellow. I backed it with a dark navy and white oversized polka dot. For the first time, I didn’t use a pieced backing. The dots are very sweet on their own. Finished it off with a crazy bright orange binding. I love the contrast. I bound it as I usually do by machine stitching to the front and hand stitching to the back. I am wondering though, if I should machine stitch both sides. Seems like a baby quilt is going to be laundered often. Would it hold up better if I machine stitched the binding on both sides? Give me your thoughts on this please! I also finished the bright greens that are the color for August. Looking through my strips, I didn’t have tons of bright green but was able to find enough to do these two blocks. So, I still have to catch up and finish March, April, May and June. Here is what I’ve got so far. This weekend I am off with my sisters for our annual “sisters’ weekend”. Cannot wait!! Hope you all are enjoying the tail end of summer. This entry was posted in baby quilt, Family and tagged "Here Boy" fabric, baby quilt, charm squares, straight line quilting on August 6, 2014 by Bernie. Around December of last year I was (like most of you) planning some quilting goals for the upcoming new year. I wanted to be sure that I made some progress and improved my skills this year. How better than by making quilts!? My thought was that I would make birthday quilts for three certain woman. I have three sons and each one has a significant other. One has been married four years now. The middle son has been partnered with his girlfriend for almost four years. My youngest son has been in a relationship with his girlfriend for about seven years now (since they were 15 or 16 years old!) These women are such a part of our family and I thought it would be fun to make each of them a quilt for their birthday. The first birthday, Kelly’s, was in mid-January. I started to work on hers just before Christmas. Because I had such a short timeframe, I chose a simple pattern. I used a stash fat quarters from Jeni Baker’s Color Me Retro line. I loved this fabric and thought it suited Kelly perfectly. After consulting with my son, he agreed! (I won this fabric from a giveaway at Diaryofaquilter.com quite a while back. It was the first giveaway I had EVER entered and I couldn’t believe it when I got an email from Amy Smart that I won. Of course I have entered a billion giveaways since then and never won again! But this was quite a prize.) For the pattern I chose to use “Tifton Tiles”. It was a tutorial at SewLuxFabric.com. I didn’t follow it exactly but the tutorial was really helpful in that it provided the basic measurements that I needed for the piecing. 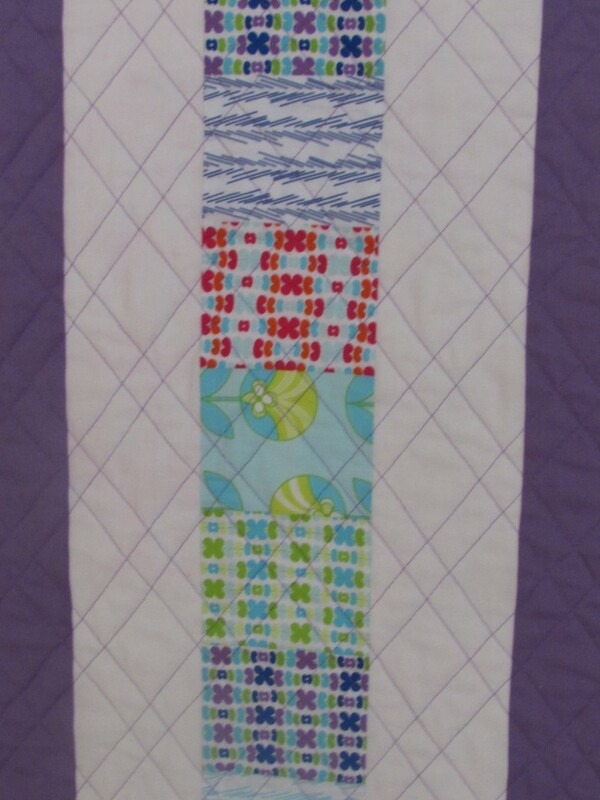 I added white sashing between the rows to add a bit of definition to the quilt. I think the quilt turned out very pretty. 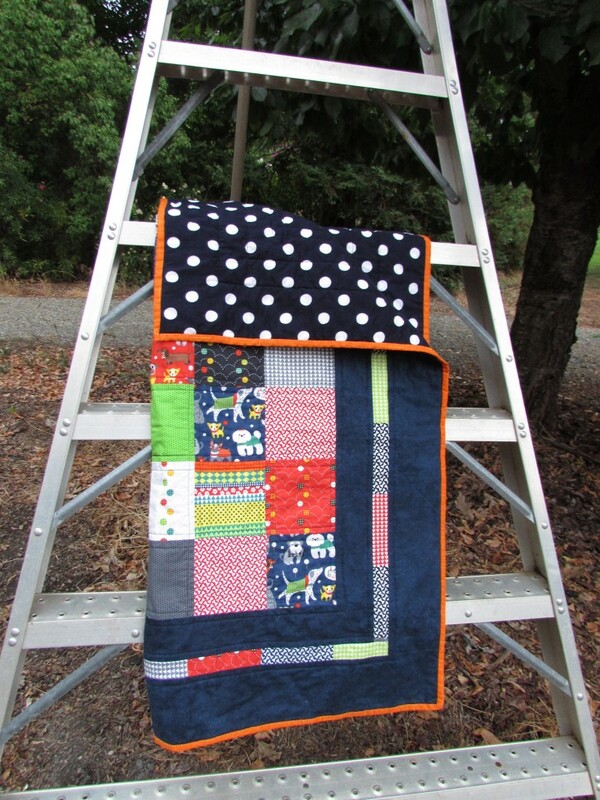 I made a pieced backing, which I love to do – it adds character to the quilt. I quilted it with an argyle, or cross hatch, pattern of straight lines. 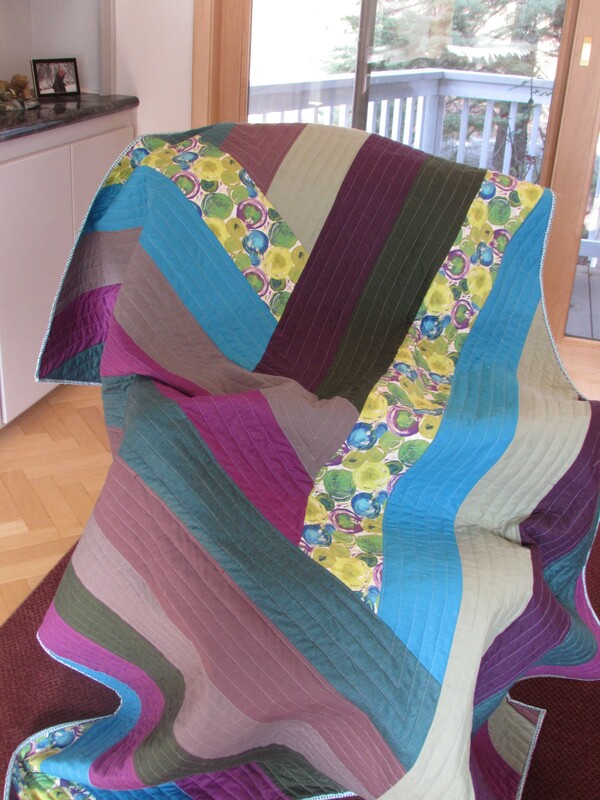 I think this was the first larger project on which I used straight line quilting. I was so thrilled when I happened upon Jacquie Gehring’s tutorial that talks about using painter’s tape for your guide. It changed my world – no more trying to draw lines or eyeball it and being so disappointed with the result! If you haven’t tried this, give it a go. It is a fantastic method. And a close up of the argyle quilting pattern. The second birthday was slated for the end of February. Once I finished Kelly’s I had to get right to work on Naomi’s (my daughter-in-law.) I wanted to try making a quilt with solids. I hadn’t done this yet. Working with Andrew, I chose Naomi’s color palette. Once I picked the colors I wanted, I decided it did need one print to add some interest. I can’t remember what line the piece was from. You can probably see that I cut the bottom strips way too long. 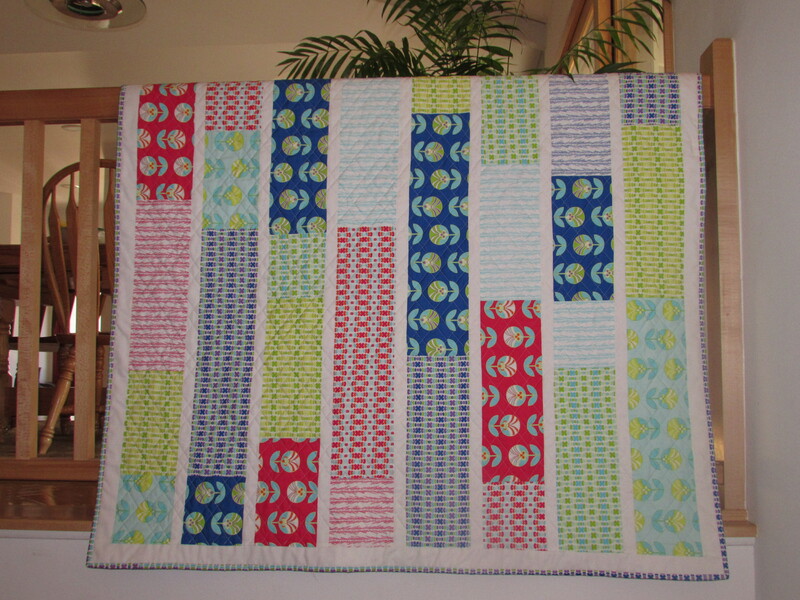 I just can’t always visualize this stuff – so I had a lot of waste with this quilt. No, not waste – usable scraps!! I used a great deal of it when piecing the back. I quilted this one with straight line quilting echoing the V in each stripe. Again, I used Jacquie’s painters tape method. So much easier! I used a gray thread which blended well with each stripe. I love that about the color gray – it sort of mimics the color of the fabric that I quilt with it. The sun wasn’t in the best position for this picture so you can sort of see through the backing. Once I washed this it softened and became beautifully crinkled. I wanted to wash it (using Color Catchers) to be sure the vibrant colors wouldn’t run. So, two of the three birthday quilts are finished. 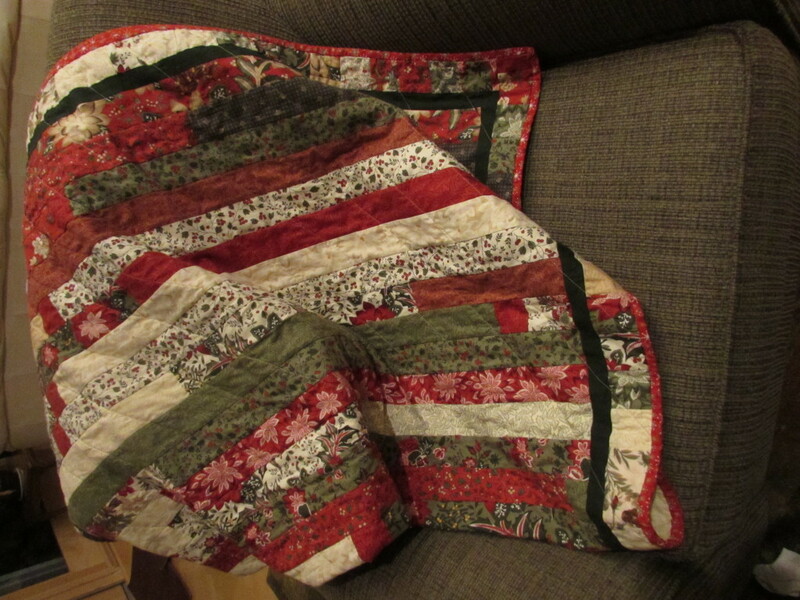 I am not going to post anything about the third quilt as I have yet to give it to the recipient. (Actually I have yet to make it! I cut the pieces this week though so I am ready to start it.) It will be ready for a certain someone’s July birthday!! 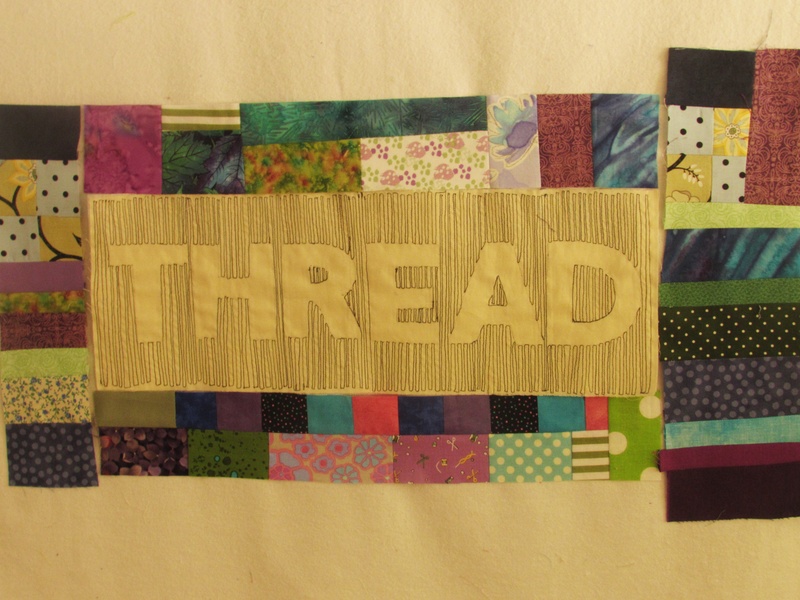 Linking up with Kelly’s Needle and Thread Thursday at www.myquiltinfatuation.com. Also over at TGIFF. 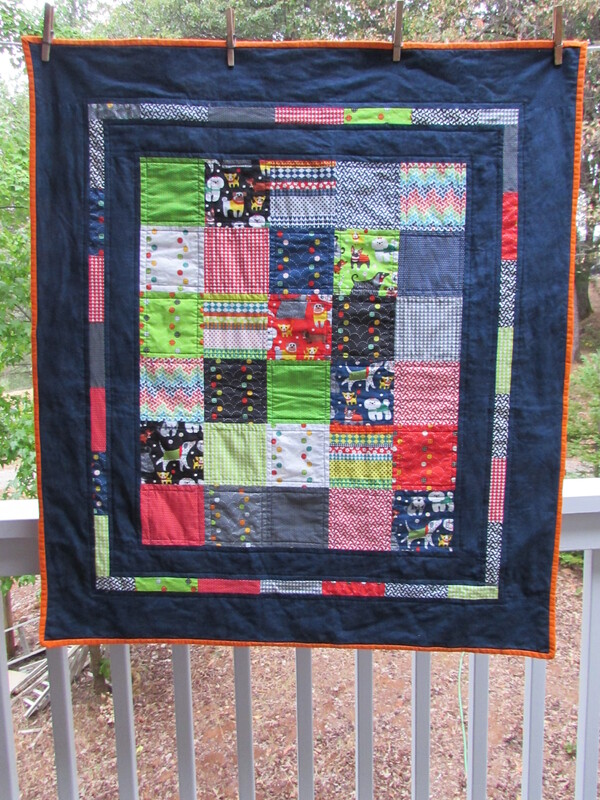 Also linking up with Amanda Jean at CrazyMomQuilts.com. 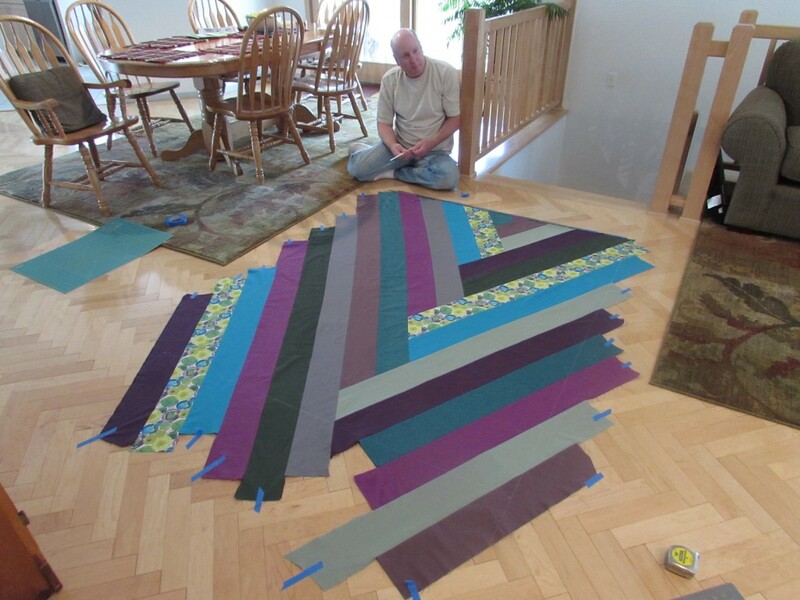 This entry was posted in Lap Quilts and tagged color me retro, jacquie gehring, jeni baker, straight line quilting, tifton tiles on June 12, 2014 by Bernie.